Just before Christmas I completed the mamoth task I’d embarked on several years ago of scanning my parents’ photograph albums. What a rash offer it was! 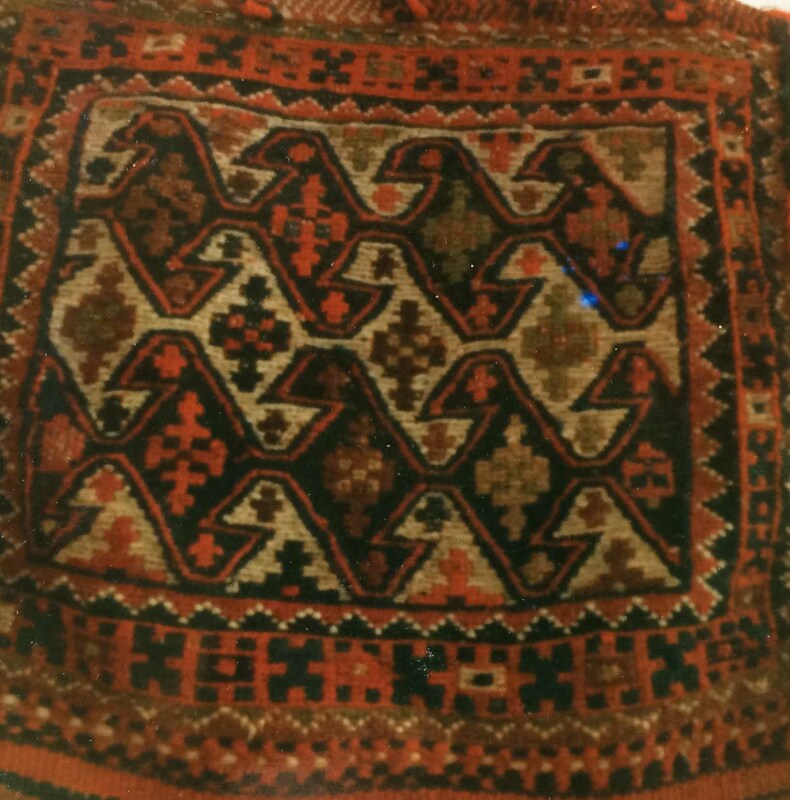 Some 20 photograph albums, dating from the late nineteenth century to 2008 – and of all sizes and shapes. The very old ones were small and easy to scan, but as time progressed, the albums got bigger and bigger – with the very last albums requiring four separate scans a page and then digital processing to unite them. Aagh! 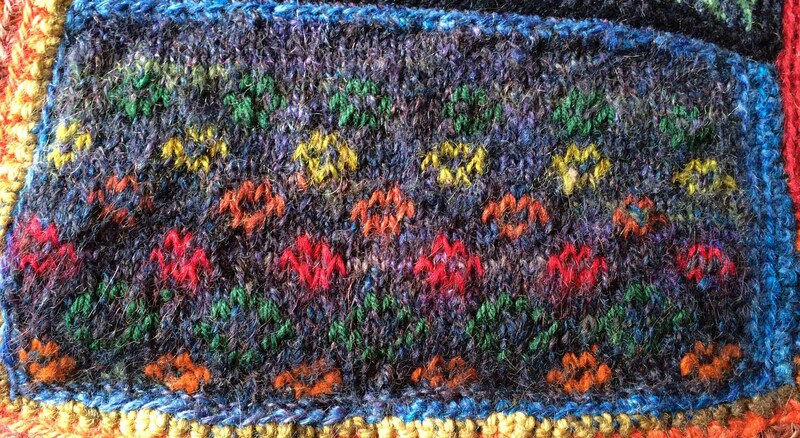 But as I began to lose heart, I had an idea – and it was what kept me going. I was going to draw together all the weddings in these albums to create a wedding story blog through the twentieth century (with a little leeway at either side). 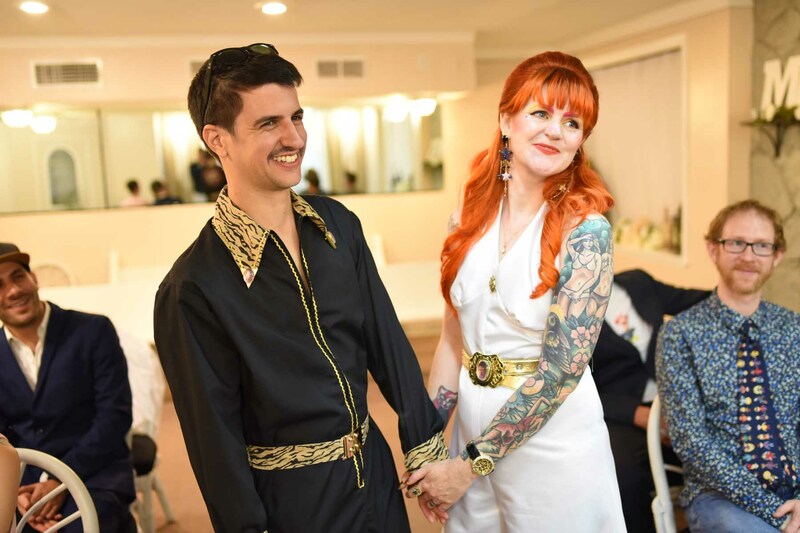 After all, weddings aren’t just a great excuse to dress up for the bride, they also show us aunts and uncles whom we never normally meet up with – and they are all wearing their wedding finery too … And what illumination weddings shed on changing mores! 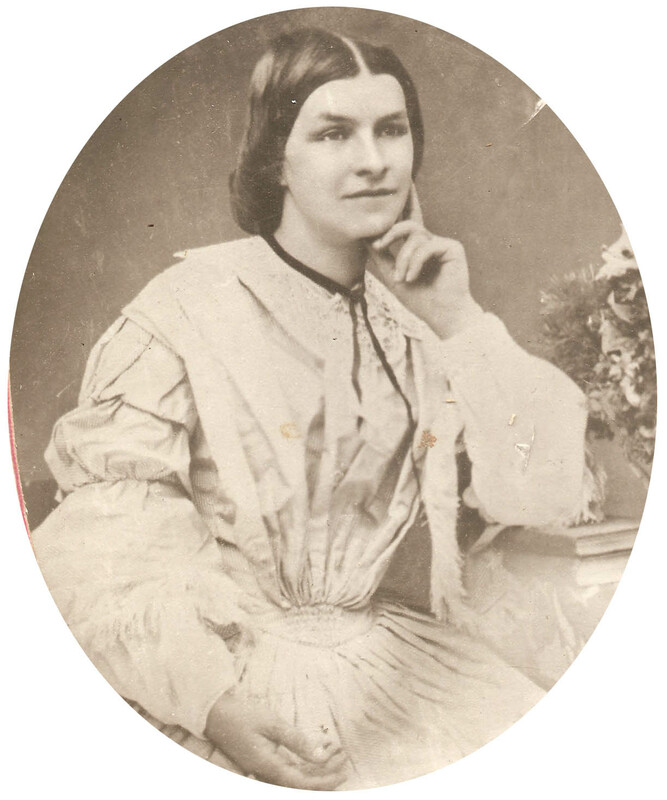 The earliest photograph I have is of Charlotte Bethel who married my great-great-grandfather Edward George Lane probably in about 1857 (their eldest daughter was born in 1858) in Heidelberg in Melbourne. 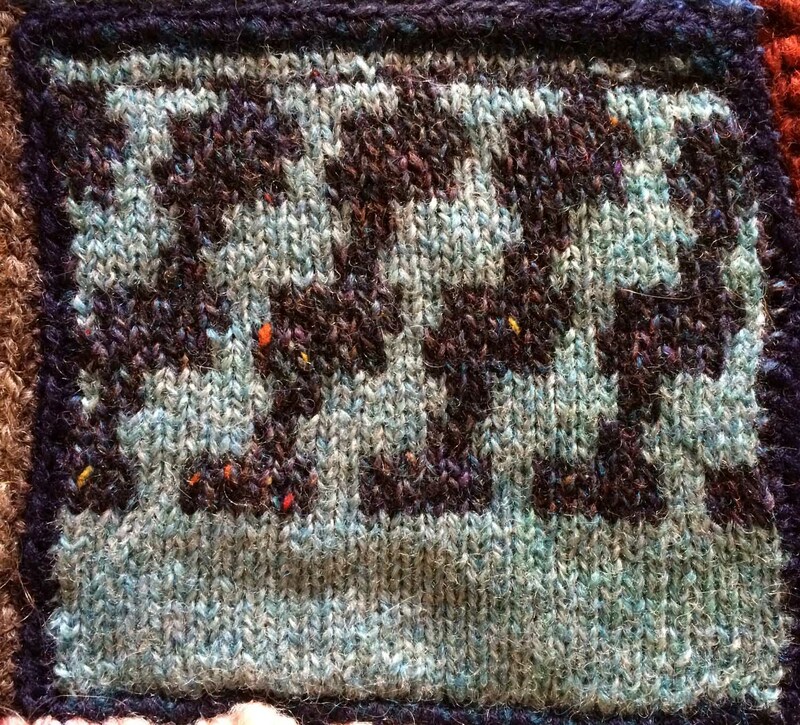 It’s an extraordinarily early photograph. In those days those who could afford it went to a photographer’s studio to have their photograph taken to mark the occasion of their wedding. You can just make out that she’s wearing a wedding ring on her left hand. I rather think the dress may be one of the photographer’s props because it doesn’t appear to fit very well … But I really love this photograph – Charlotte looks very happy, very self-assured (dress loan or not) – and very elegant with that simple unfussy hairdo … By contrast her daughter, Marian, looks most ill at ease in her wedding portrait. 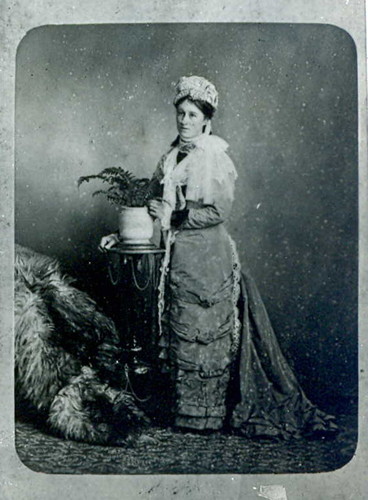 By this time the family had settled in New Zealand, so her marriage to Charles Church took place on the 30th March 1880 at St Luke’s Church, Oamaru. Marian is looking a lot more dressy, staged and formal than her mother does above – and frankly a bit fussy too. She doesn’t look particularly comfortable (perhaps she realises this photographer’s prop, the fur rug, is stealing the show) … Leaving my Antipodean family aside, we now skip across continents to my step-grandmother’s Leicester wedding. 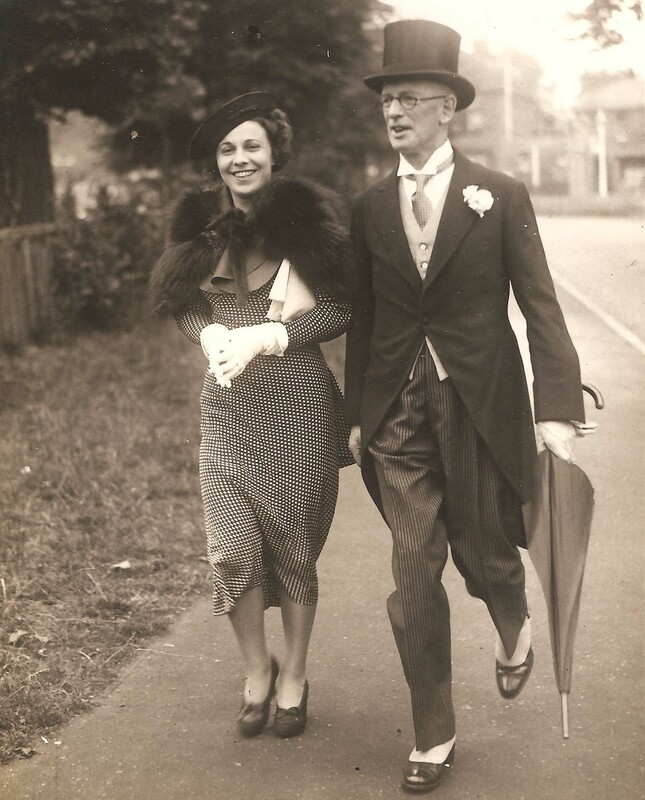 Nancy Goddard (daughter of chemist and businessman Sir Joseph Goddard) married Arthur Evans on the 15th June 1904. The quality of this photograph is stunning, really capturing the radiant beauty of the young lady we later called Great-Gran. 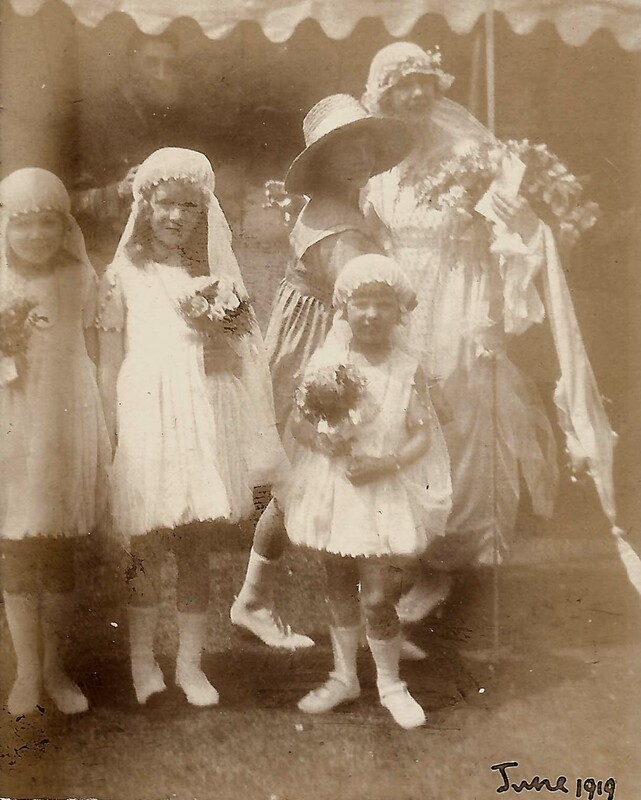 Again, it’s a studio photograph – and I’m quite sure it was taken by the very best Leicester society photographer … Then we come – in 1919 – to the first wedding photograph that was actually taken at the event itself. 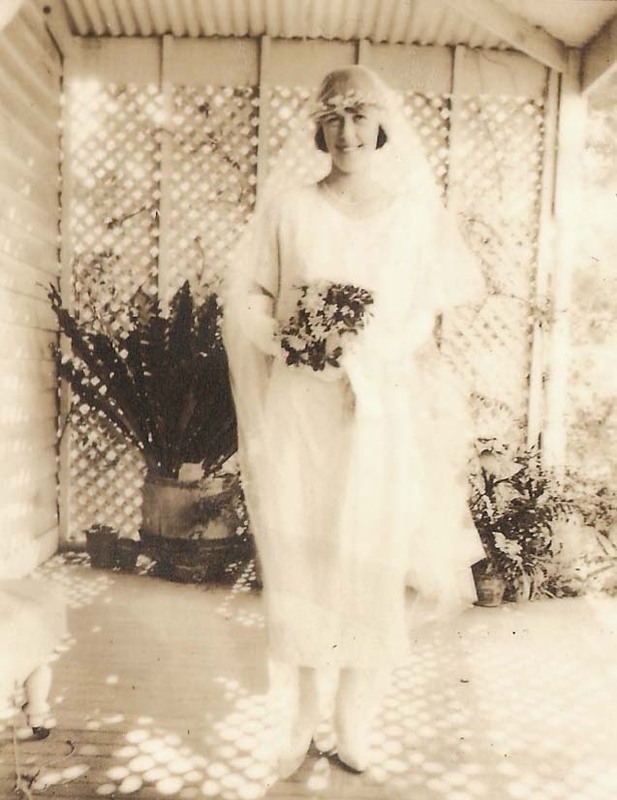 The saddest thing is that I cannot tell you anything else about this charming bride other than the fact that the wedding took place in June 1919. The photograph is in my grandmother’s photograph album, and I guess the people were so familiar that she felt no need to add further details. Tantalisingly overexposed so it’s very hard to make out much of the details of her wedding dress – it looks like a sprigged fabric with a light overcoat and a long tassel-y thing that she’s carrying over her arm (part of a train?). And oh – those funny little mob caps on the bridesmaids! Her husband is in military dress, so I guess recently demobbed. 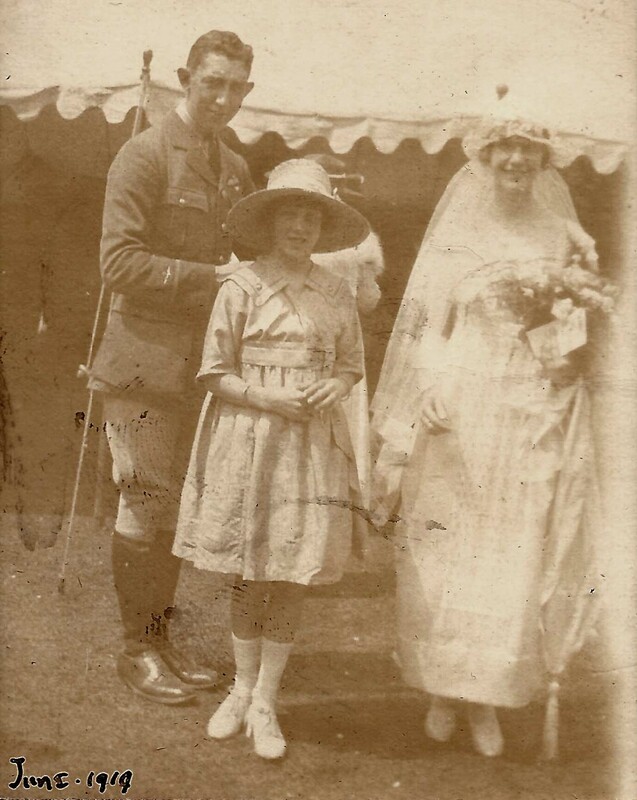 So soon after the end of the first world war – how can we possibly imagine their feelings when so many of their friends and relatives must have died … The war did have a visible impact on my maternal grandmother’s wedding. 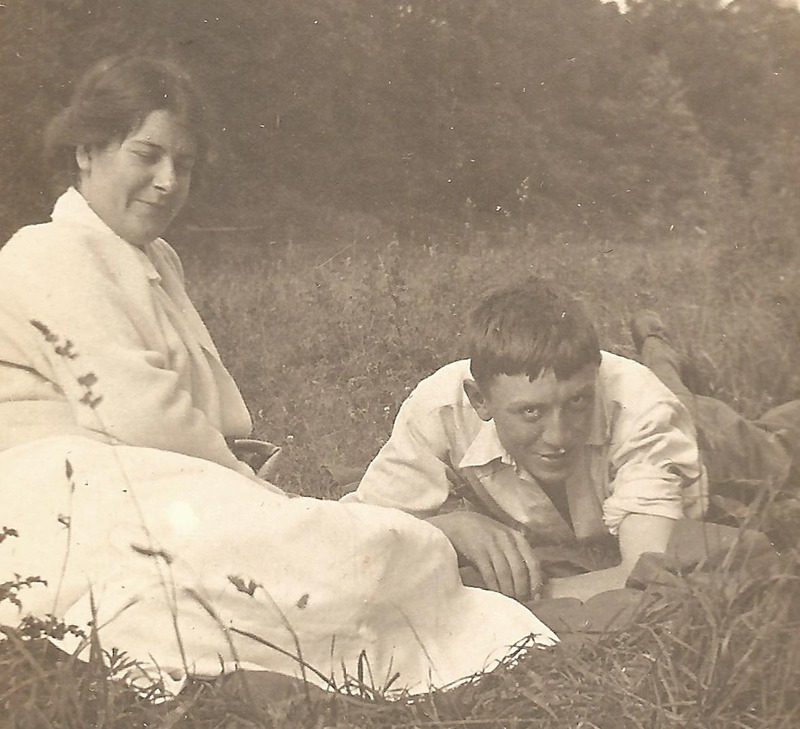 She married my grandfather at St Mary’s Church, Leigh Woods (on the outskirts of Bristol) in October 1920. 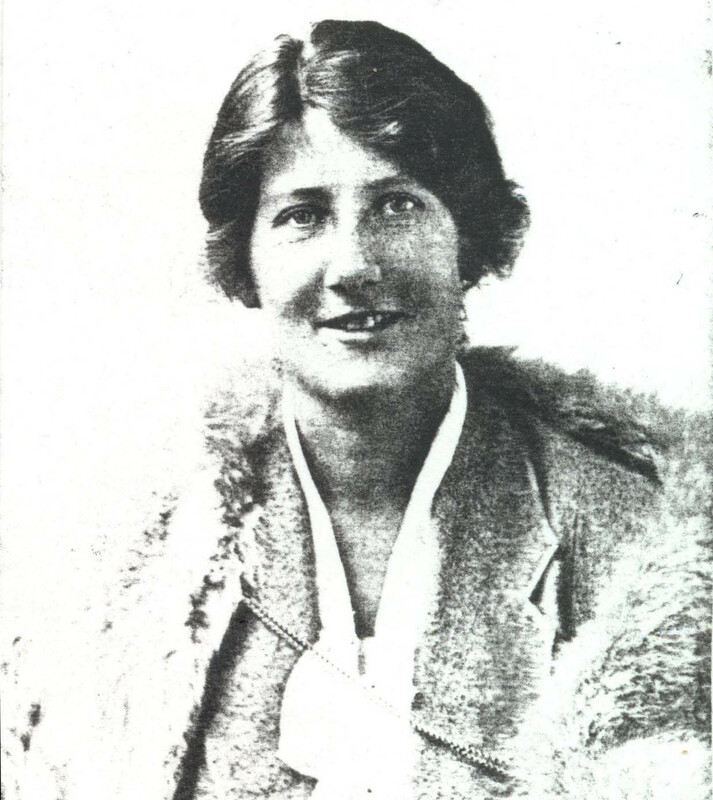 But her sister, Phyllis, had died earlier in the year of septicaemia which she had contracted as a trainee medical student in Bristol. 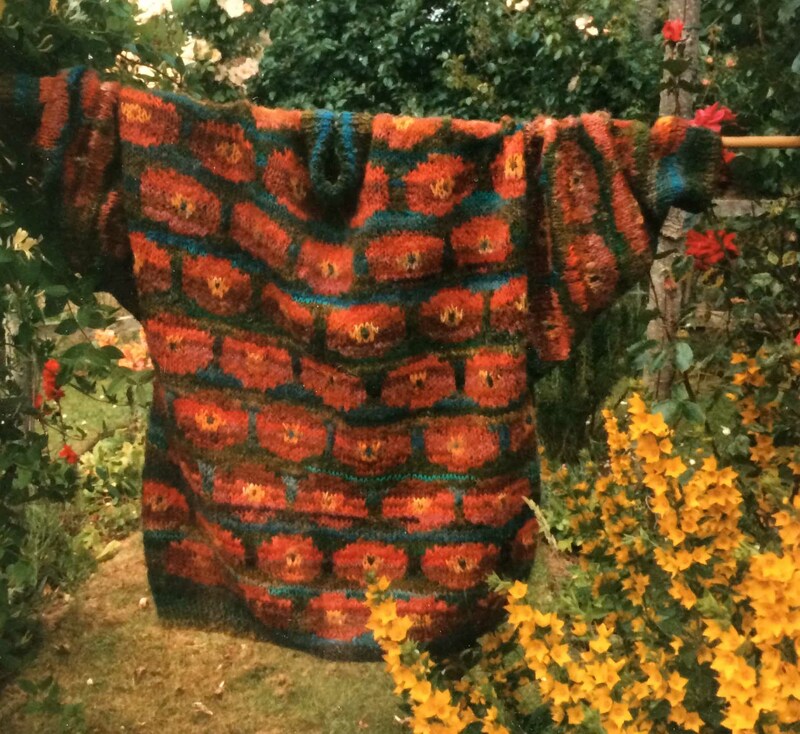 Here is Phyllis – smiling, several years earlier …. 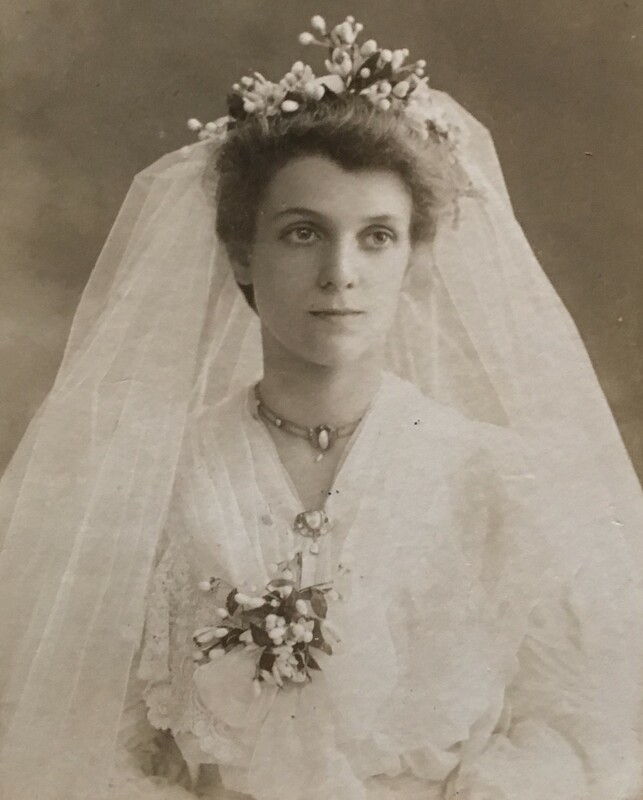 So there were no wedding photographs – but my grandmother did have a formal photograph taken to mark her engagement, and it shows a sweetly smiling optimistic face … Back to Australia now for my other grandmother’s wedding. 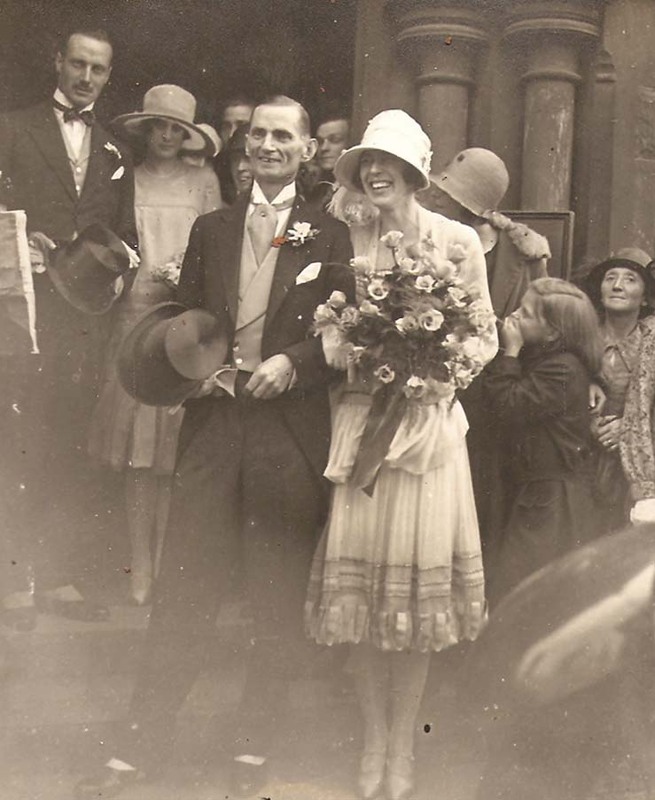 Dora’s wedding to my grandfather, Vin, took place at St George’s Church in Melbourne’s Surrey Hills on April 23rd 1923. It’s very hard to see what she’s wearing in this overexposed photograph – though they do look blissfully happy and in love. Their stance and the loving look between them is quite unusual for wedding photos of the time … You get a much better idea of the very simple dress she is wearing in this photo taken in the family summer house (perhaps before the wedding?) 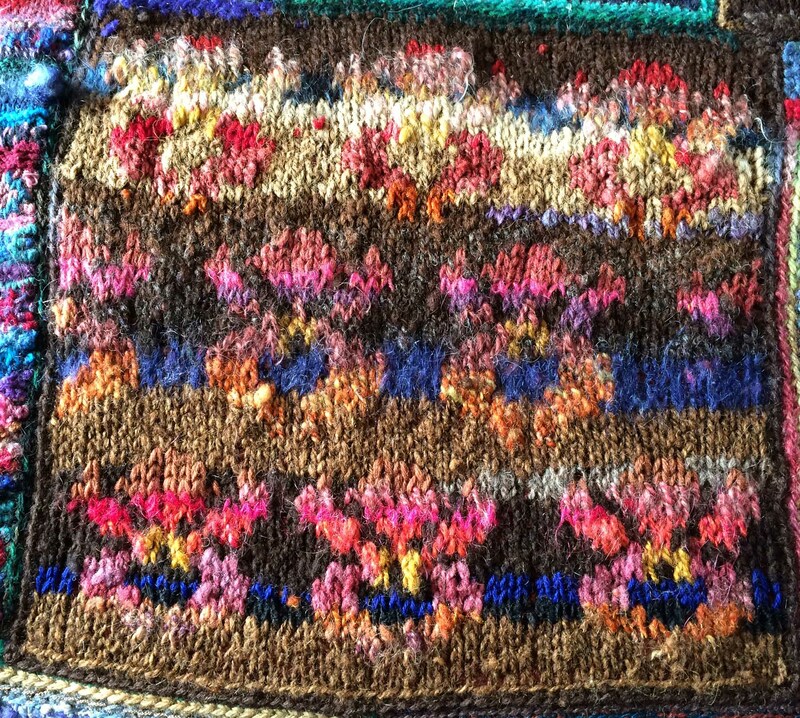 My grandmother was an enthusiastic gardener all her life, and I am sure she has chosen particular flowers for her bouquet – I just wish I could identify them! 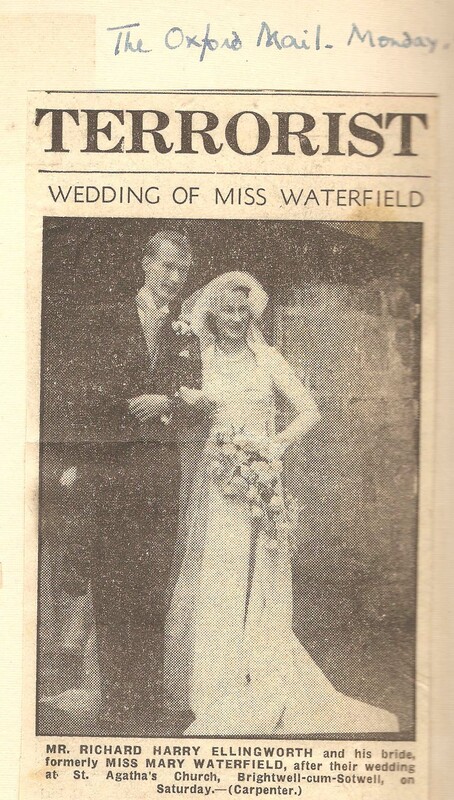 Rather strangely she seems to be wearing long gloves … My grandfather’s brother, Cliff, features in the next wedding with his wife, Edith. Cliff was working as a doctor in England, so this 1926 picture is of the couple outside Hammersmith registry office. She’s wearing a real flapper dress – such beautiful detailing round the hem … Tragically my Australian grandfather Vin died in 1933. 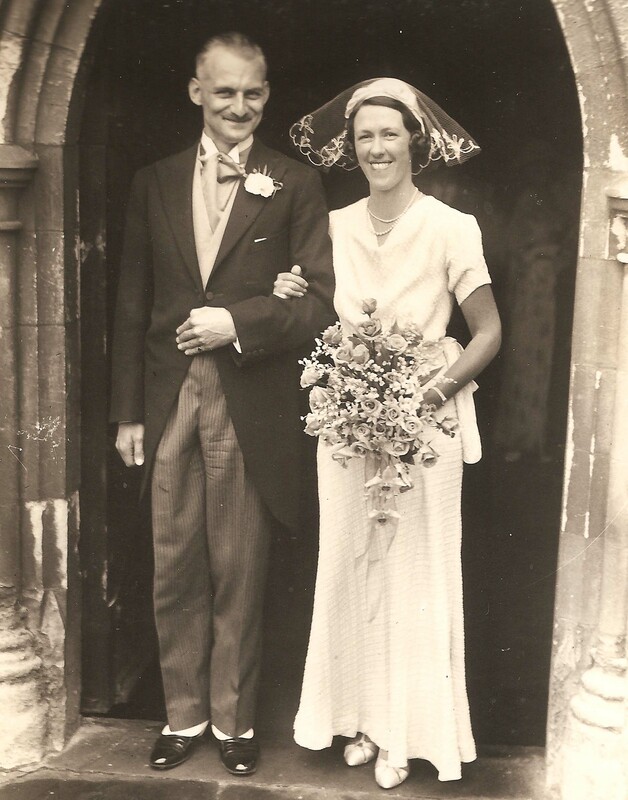 My grandmother had met an English colleague of his through their business dealings, and her second marriage in 1937 was to this Englishman, Roger Evans, at Chislehurst church in Kent. 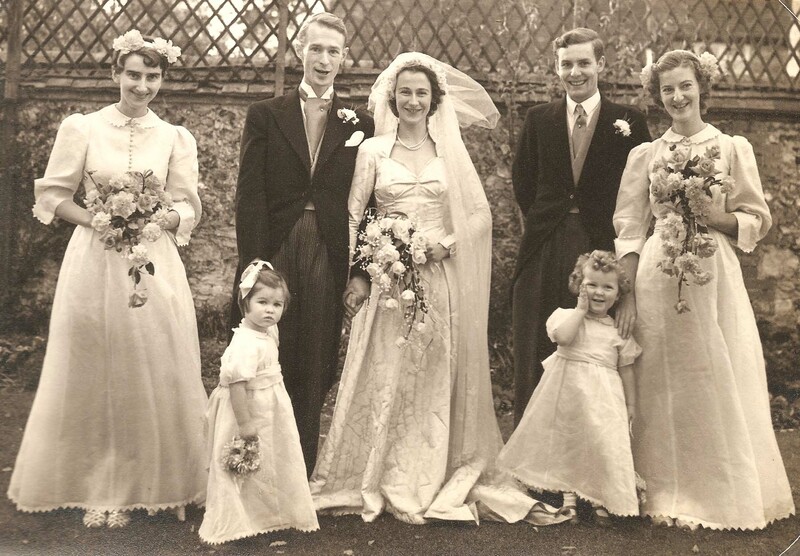 What is striking about this wedding is the simplicity (again) of my grandmother’s dress (silk, cut on the cross, I think, with a lovely drape) in contrast with the stuffiness of all the affluent Leicester family and friends who had travelled down to Kent to attend the wedding … His mother’s dress is a fussy disappointment – look how creased it is! 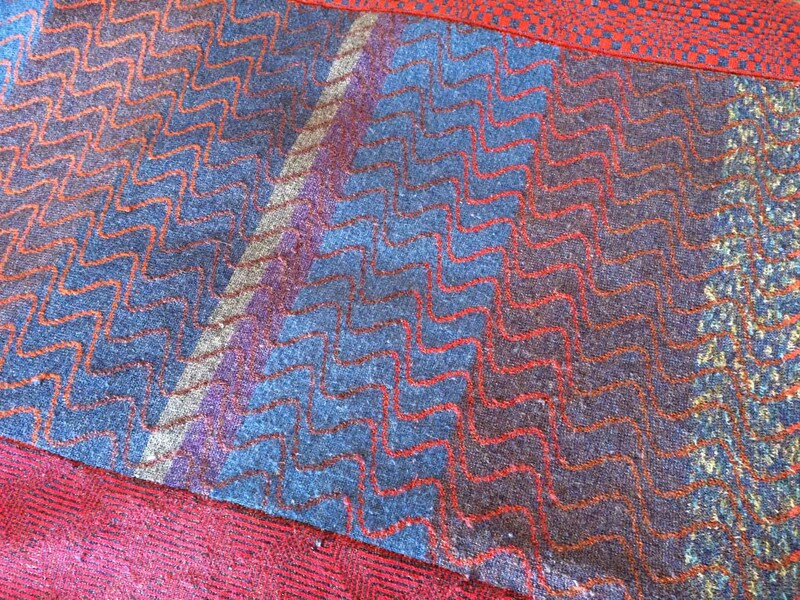 But I rather like his sister Daphne’s bold dress on the left. These are all black and white photos of course so we have no idea what colour these clothes are. 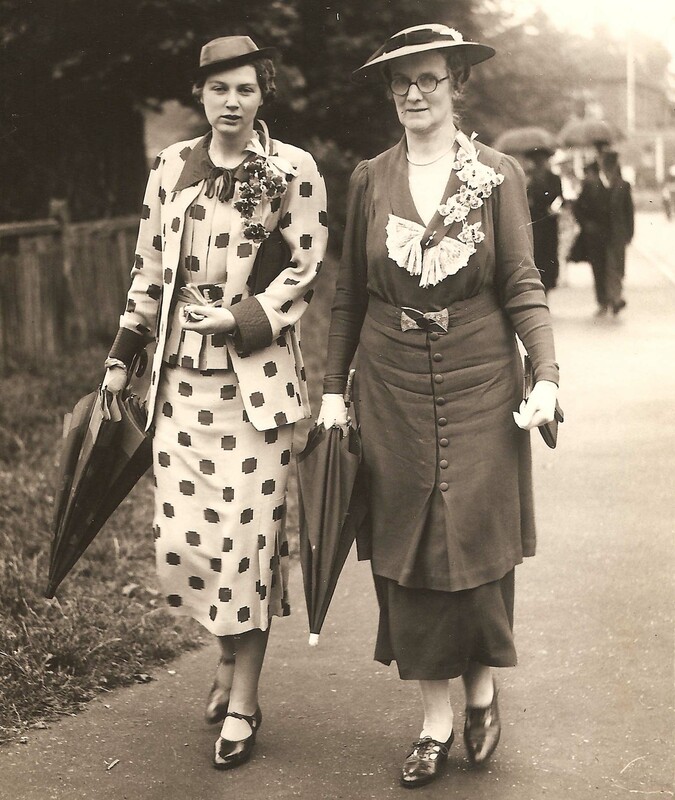 I’m guessing the creased dress is a very safe dark blue, and I rather fancy Daphne’s dress is cream with blue spots on it … The star of the guest show is definitely Vera (in this fabulous spotty number and perfect little raunchy fur cape and jaunty cap) and husband Holland in his spats! But just look at the other aunts and uncles here! 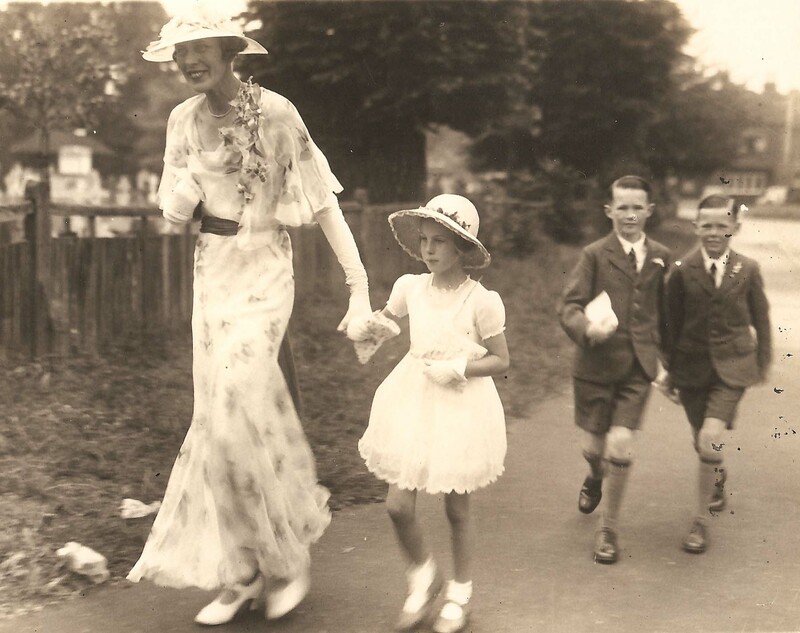 Perhaps the most poignant thing about this wedding is the two little boys running to keep up at their mother’s second marriage … 1950 now, and the next generation are getting married. 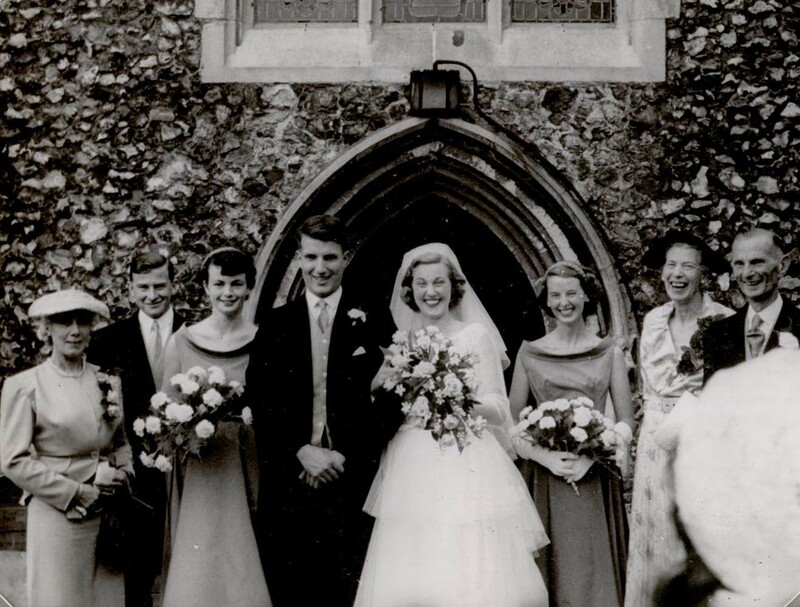 This is my Uncle John marrying his glamorous American wife, Lee, on the 25th February in St George’s, Hanover Square. His sisters, Mary and Jill, are the adult bridesmaids in attendance. 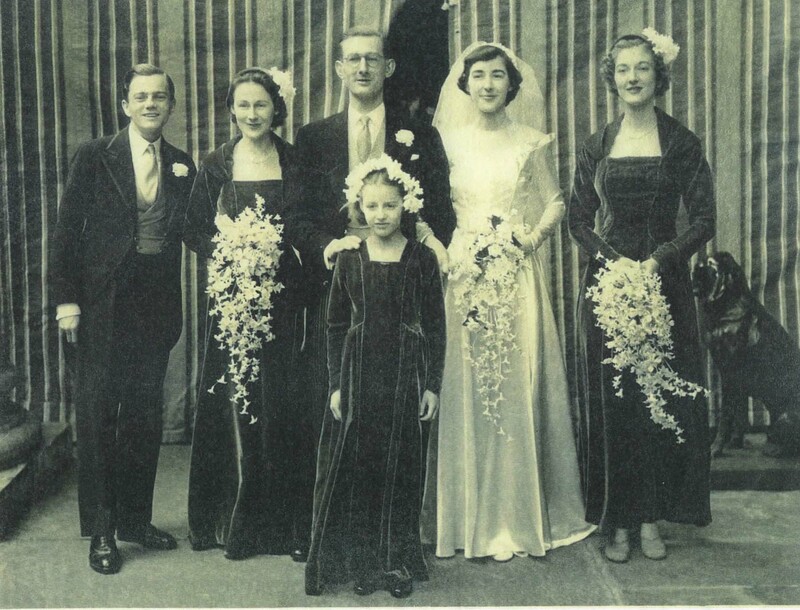 I really like the dark velvet dresses they are wearing – perfect for a winter wedding … The weddings are now coming thick and fast for this post-war generation. 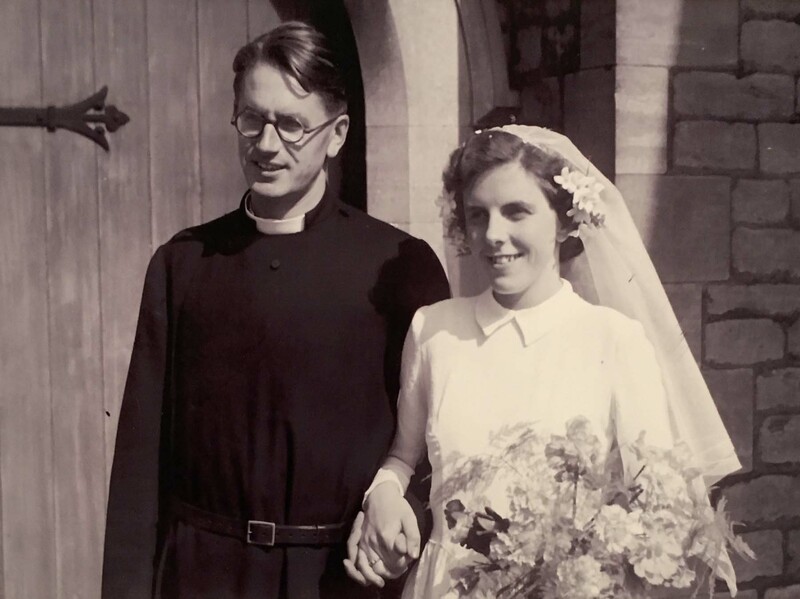 Here are Stephen’s father and mother, Robin and Betty, getting married on September 8th 1951 at St Paul’s Church, Peterborough (his workplace as he was curate there!) 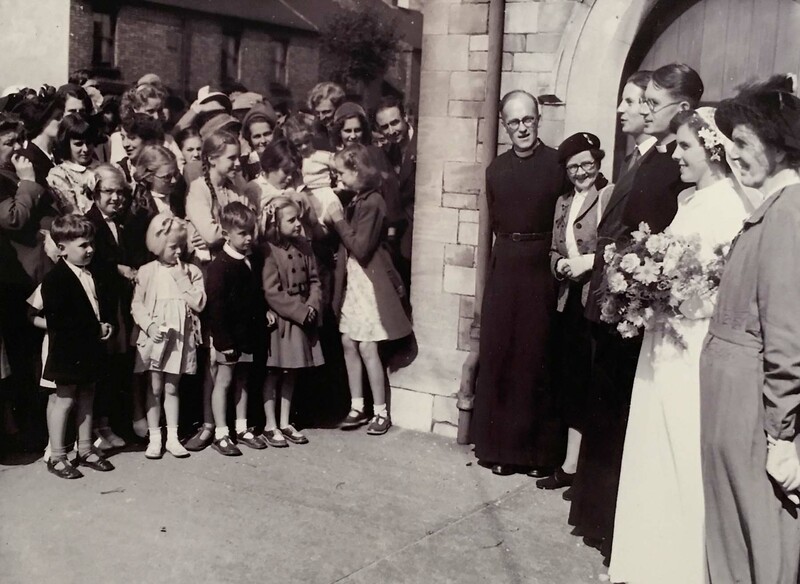 A most unusual wedding photograph of theirs shows the crowd of his parishioners watching. Such a common sight to have a village turn out to see a wedding but so seldom captured … (however they may have come to see the groom’s brother, David Dunhill, who was a well-known BBC radio presenter of the time and is the man who appears to be speaking to the crowd here) … 1952 and another glamorous London wedding – this time for my father’s cousin, Australian theatre designer, Ann Church. 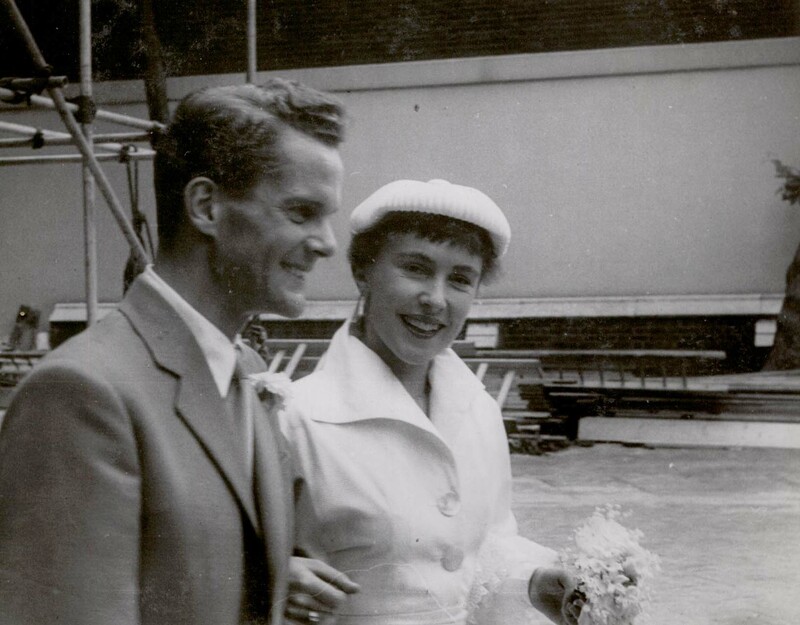 Looking fabulously chic, she married Raymond Bury in St Paul’s church, Knightsbridge … ( pity about the scaffolding) … Now it’s my parents’ turn! 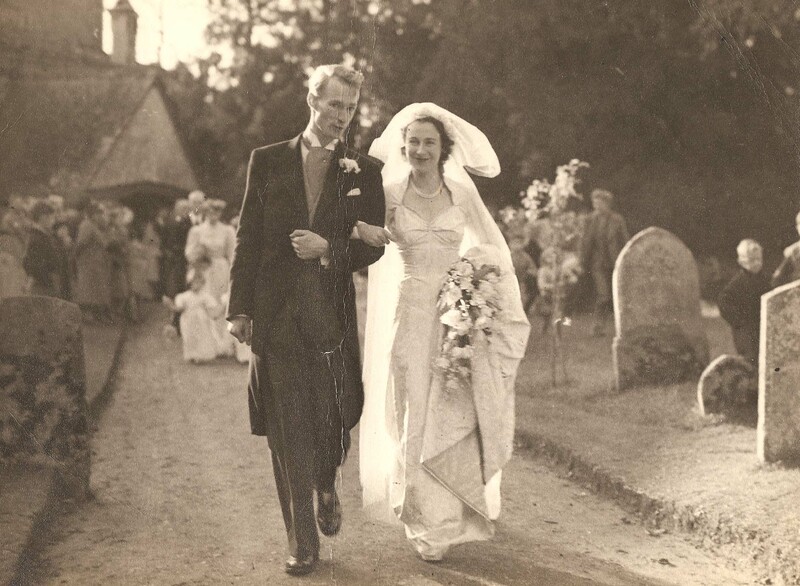 Their wedding took place on 25th October 1952 at St. Agatha’s Church in Brightwell, near Oxford. Traditional – and very sweet. They look so young … But you have to laugh at the juxtaposition of articles that appeared in the Oxford Mail! 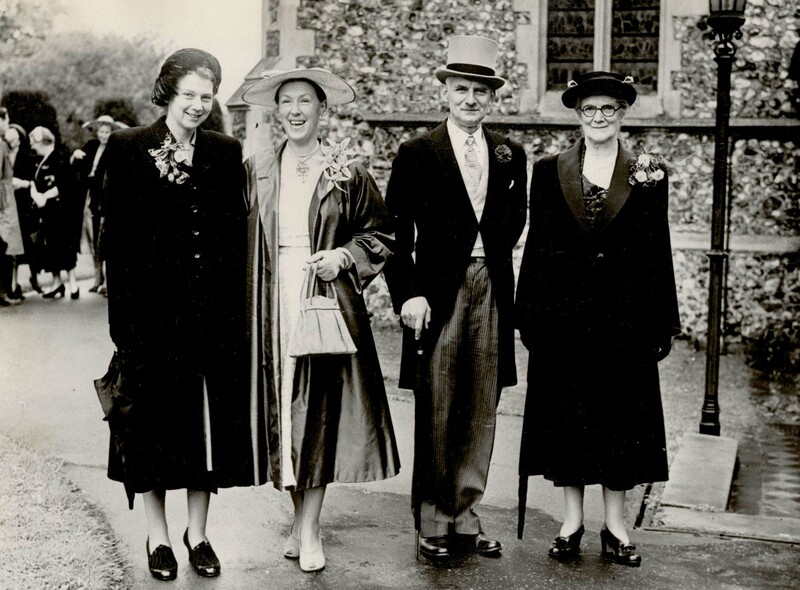 This is my favourite photograph of the two of them – scampering off together for a private word … 1953 and another cousin of my father’s gets married – this is the little girl (all grown up now) whom he scampered after at his mother’s second wedding … The Leicester contingent turned out for this wedding in their usual style. 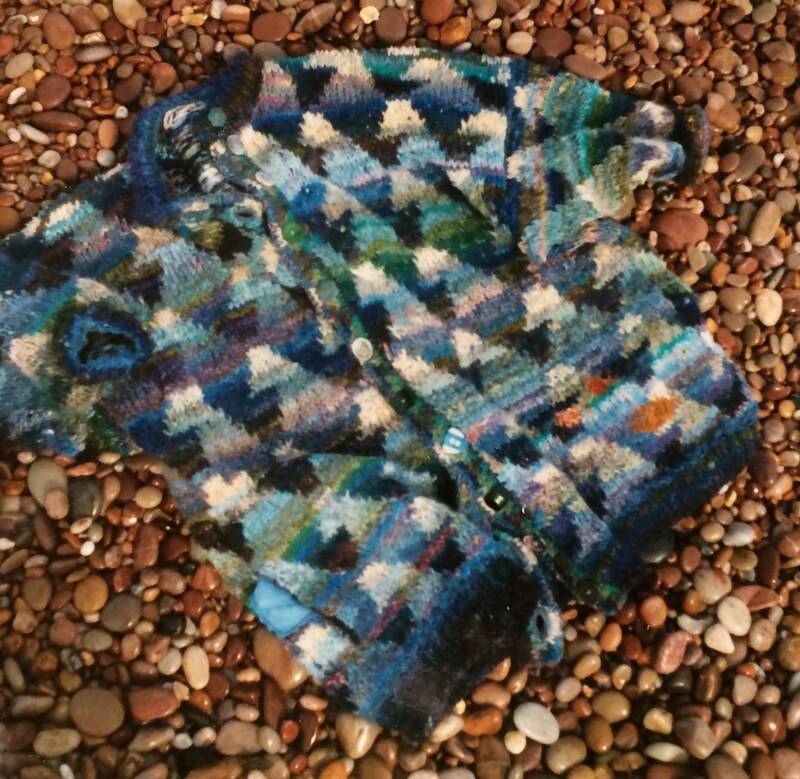 I’m amused to see that my grandmother (who married twice in the most simple of dresses) has succumbed to Leicester style. 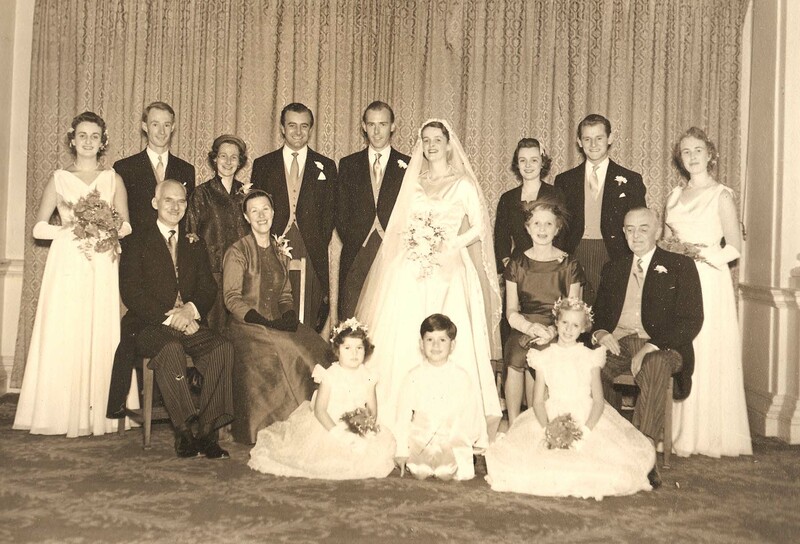 That’s her, second on the left – and if you look carefully you’ll see her stealing the show with her glamorous confident dressing in many more wedding photos … 1955, and Shirley was the most beautiful of brides when she married my Uncle Bill at the Church of the Immaculate Conception (what a name for a marriage venue!) 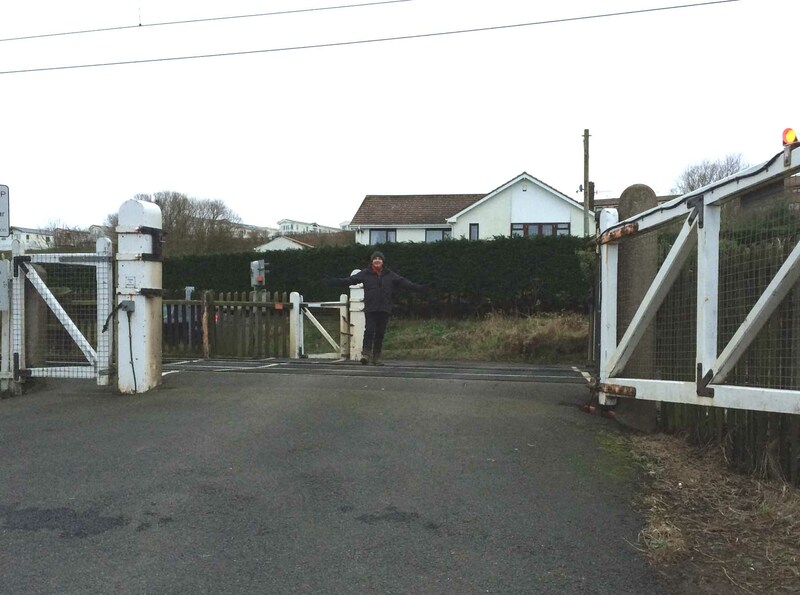 in Sicklinghall near Harrogate. 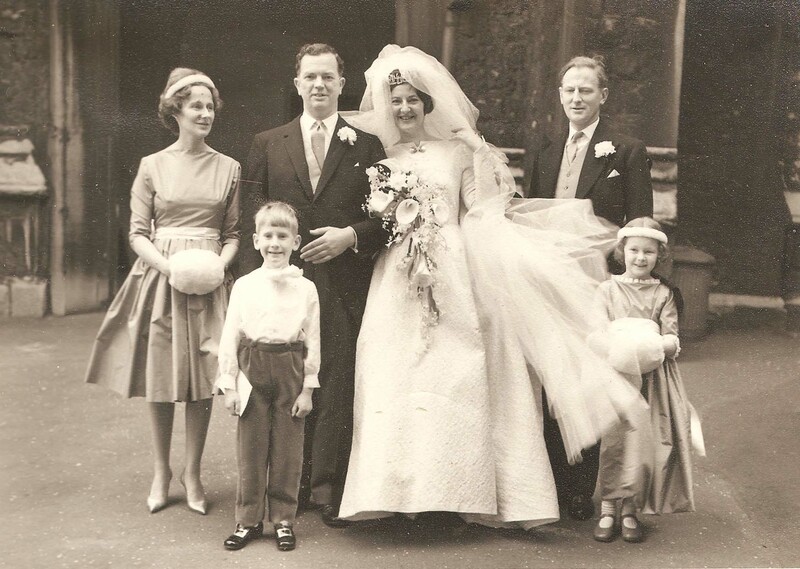 I guess my grandmother’s allowed to glam it up for her youngest son’s wedding … Skip a few years to 1961 and this enchanting picture of my Aunt Jill marrying Harry at St Michael’s, Chester Square – I just love that bouffant veil! It was February 18th and chilly so we had the most delicious little white furry muffs to keep our hands warm (I’m the littlest bridesmaid on the right) … And here are the wedding guests. 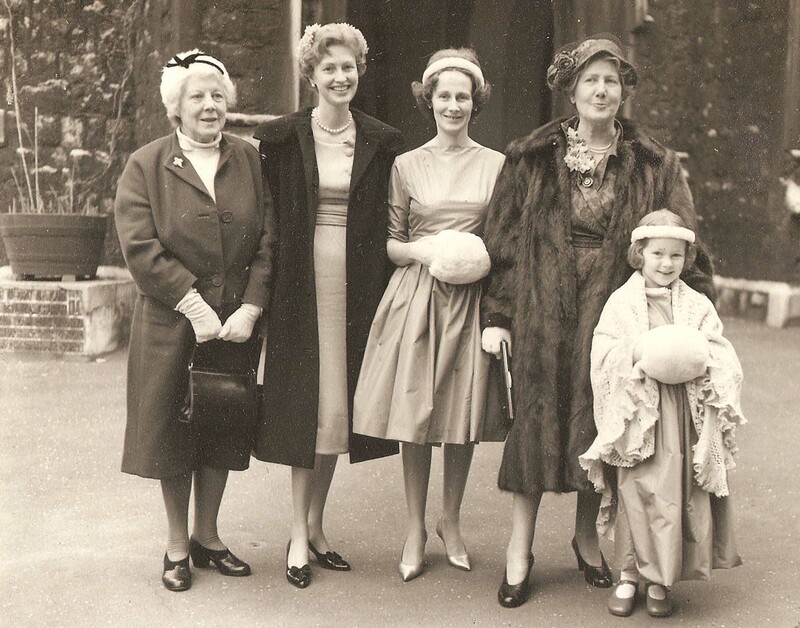 This is my mother’s side of the family – and they just don’t do glam like my other grandmother … 1962 brought another family wedding for my grandmother Dora to get her wintry glad rags on. 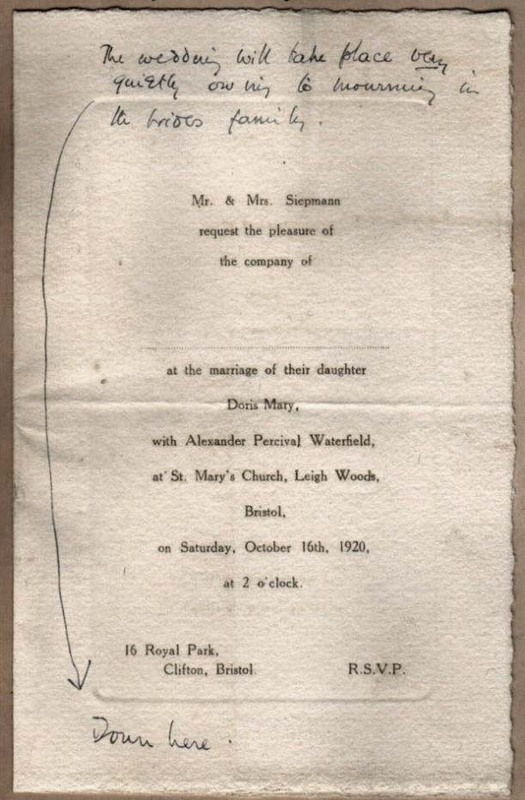 This is my great-aunt Daphne’s wedding to New Zealander, Philip, on December 29th at St Mary Magdalene Church, Knighton (in Leicester). 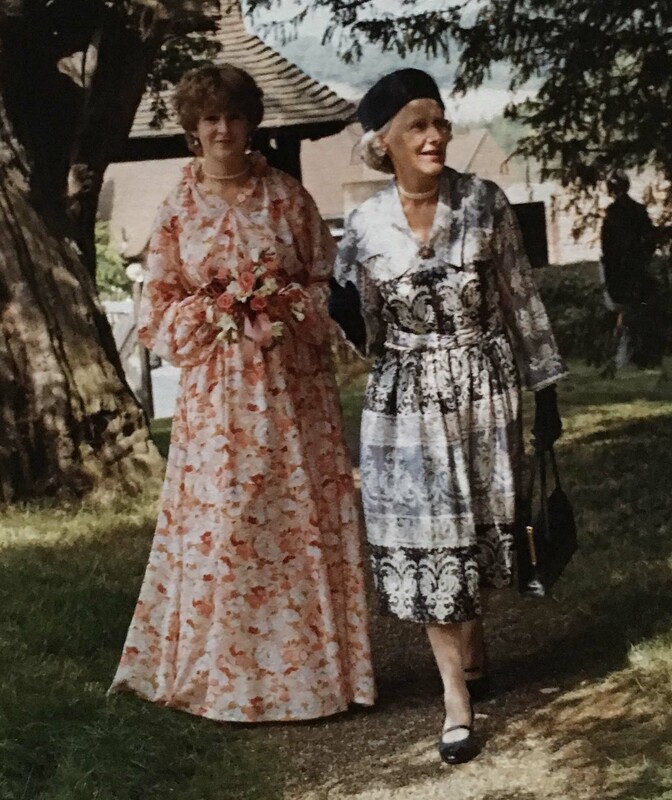 This was a surprise wedding – the couple were both in their fifties when they met – and I don’t think her family ever expected her to get married … Aunty Daphne (as I called her) died some years ago now. When she died, I received this very touching little box containing the leftover scraps of her wedding dress. It’s just the most beautiful shimmering and creamy fabric – with pictures of magnolias woven into the fabric. 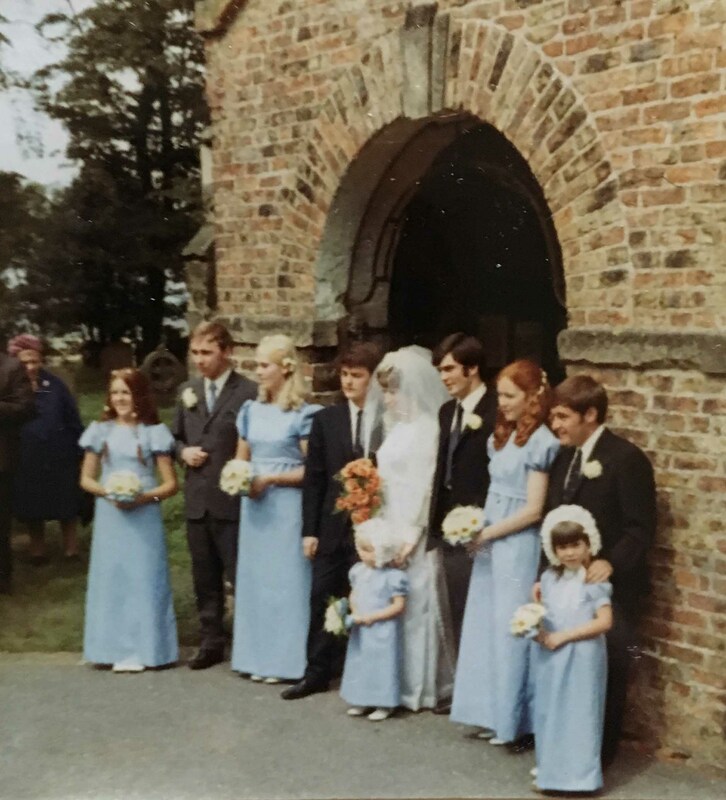 You really have no idea from the pictures that were taken that day … 1970 and I was a bridesmaid again – this time for Patricia who was marrying Dave at Holme-on-Spalding-Moor church. 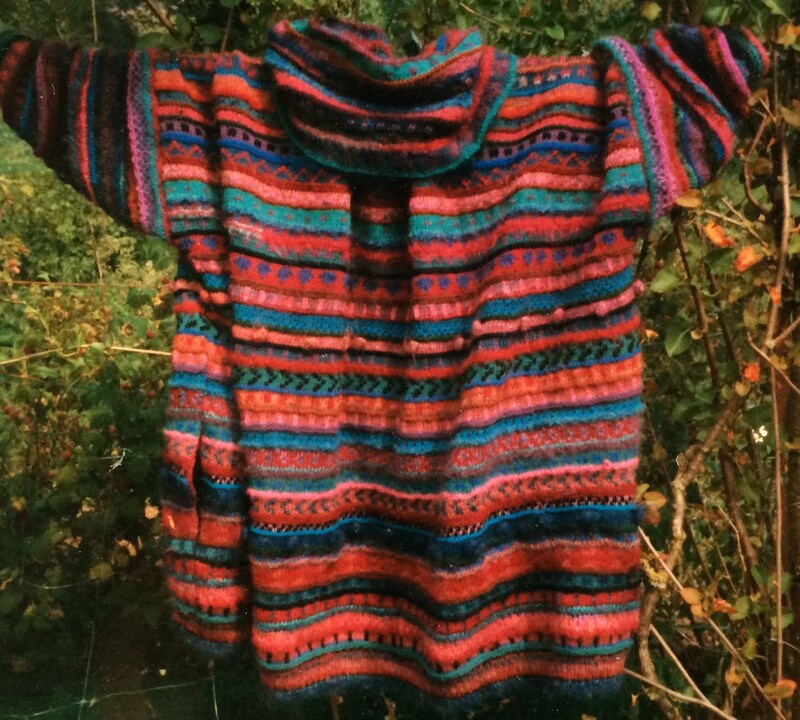 Several years older than me, she’d been my companion when I stayed with my grandparents at their Yorkshire holiday home … And my goodness, the next wedding in the albums is mine! Weddings are funny things. I can show you all these lovely pictures of happy couples and their dressed-up relatives, but that doesn’t really tell you anything like the whole story. 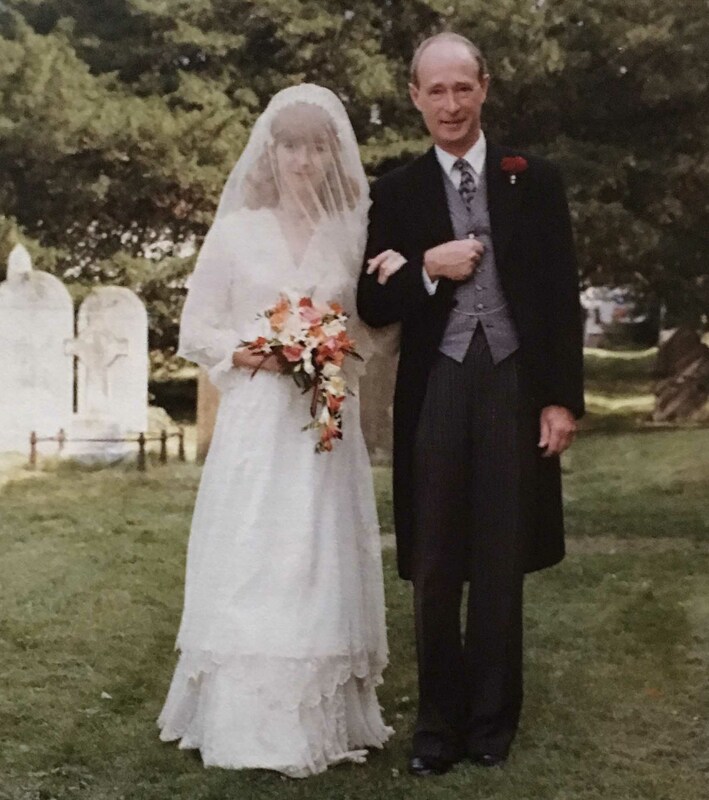 I married Hugh on the 1st of September 1979 in the church of St Peter and St Paul, Farningham, Kent. It wasn’t really the marriage that Hugh and I intended. 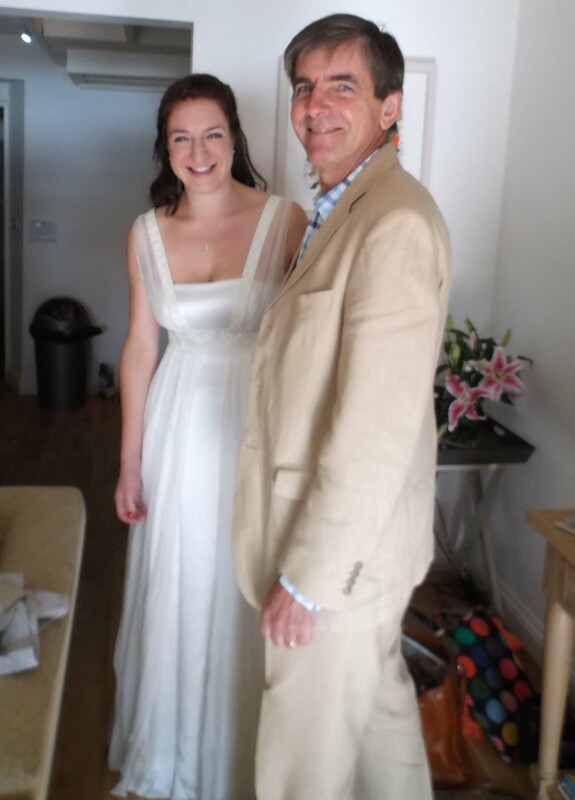 So – in the end, Hugh and I went back to Devon where we were living (together) and working, and left our families to get on with it … I chuckle to remember this when I think of modern weddings I have attended where brides have organized details down to the nth degree. 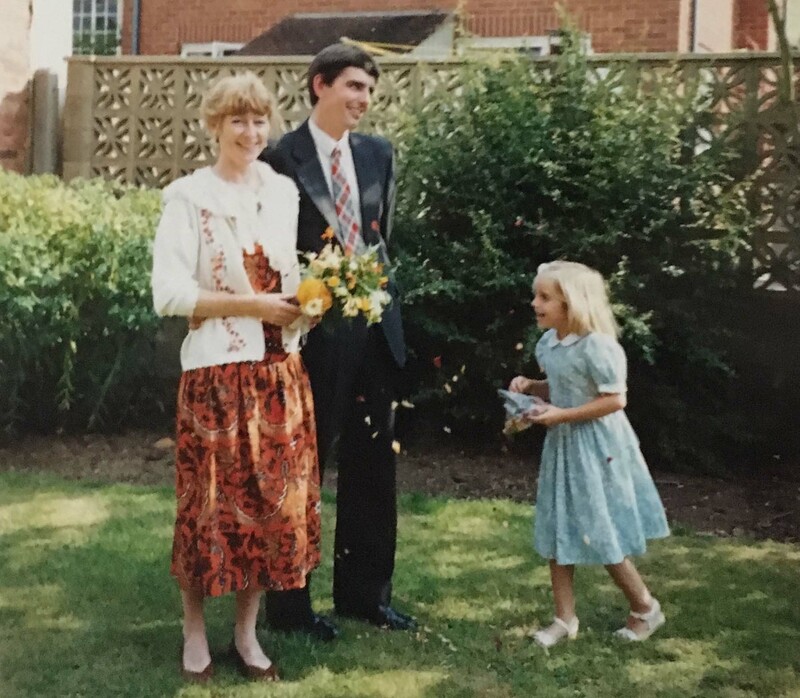 I didn’t even chose my sister’s bridesmaid dress (my mother did) … As it turned out it was a very happy wedding, a really great party. The local bank manager told me afterwards that is was the wedding of the year for Farningham! What more can I say …! 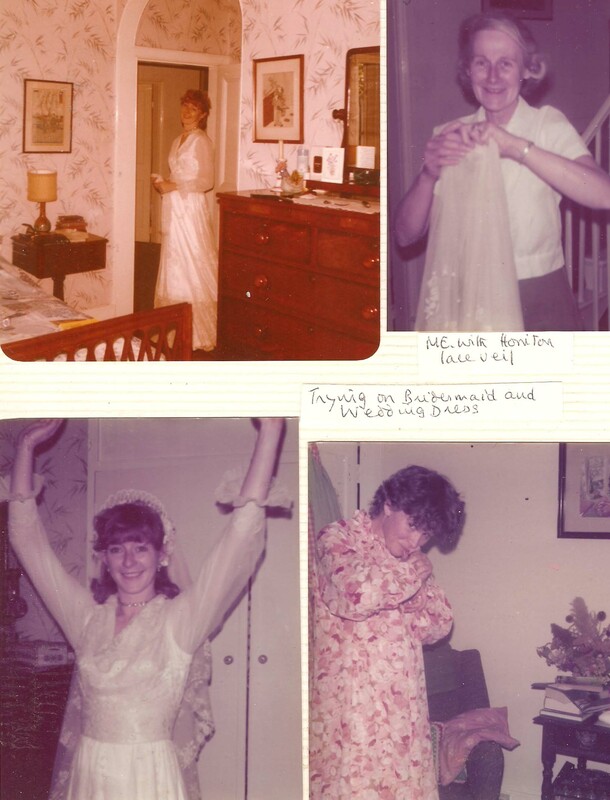 The photograph albums are full of pictures of us all getting the family home ready in the days before – trying on the dresses, getting out the family Honiton lace wedding veil … My mother made Elizabeth’s bridesmaid dress, – and her own dress, – and the very fine patchwork cope the Reverend Dennis Sweetman is wearing here. I didn’t make myself that ivory silk dress piped with scarlet but I did make the lace dress I’m wearing (as I cuddle the discomfited oldest daughter of my current husband) … My dress was pieced together from all sorts of bits and pieces of lace. There was a beautiful lace overskirt with swags and a scalloped edge … Where did I get the lace, I wonder now? 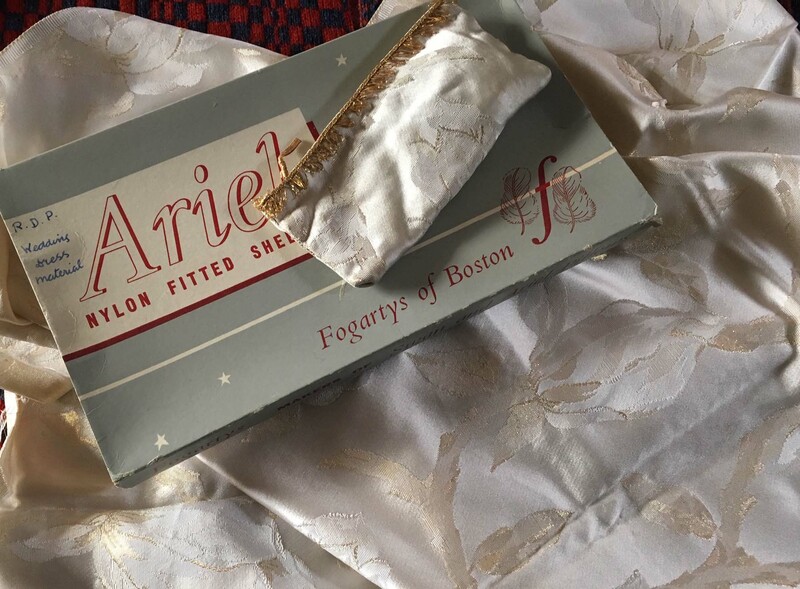 I don’t honestly remember – but there were always lacy bits of fabrics in our home, handed down no doubt from all these ladies you’ve seen earlier in this blogpost. 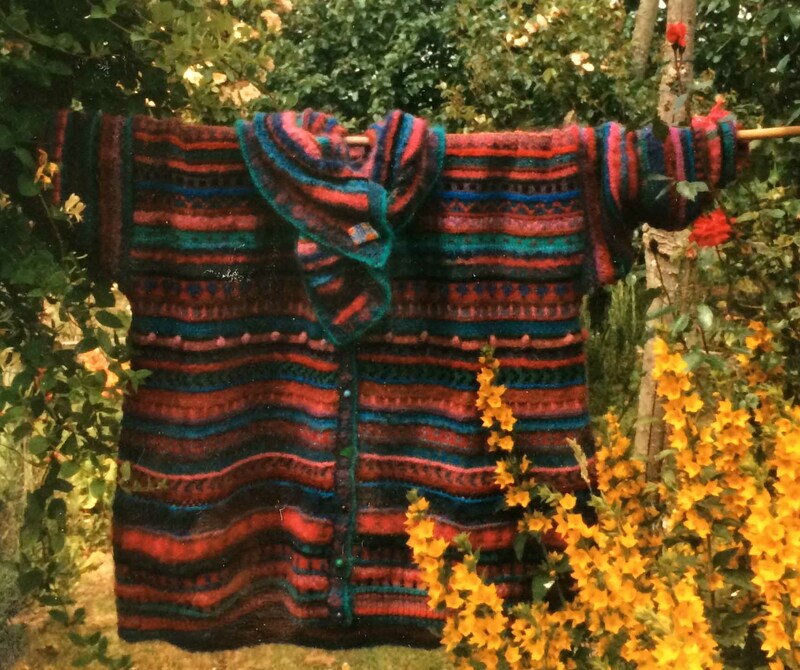 And it was very easy to buy exciting old clothing in markets and secondhand shops in those days … I still have the dress – but recently had cause to start unpicking it (of which more later on) … The next wedding was my new husband’s brother’s wedding to Georgie just before Christmas 1980 at Motcombe in Dorset. Such a beautiful winter wedding.. That brings us to the end of the classic white weddings with rather a jolt because the next wedding is my brother’s at Oxford Registry Office in April 1985. 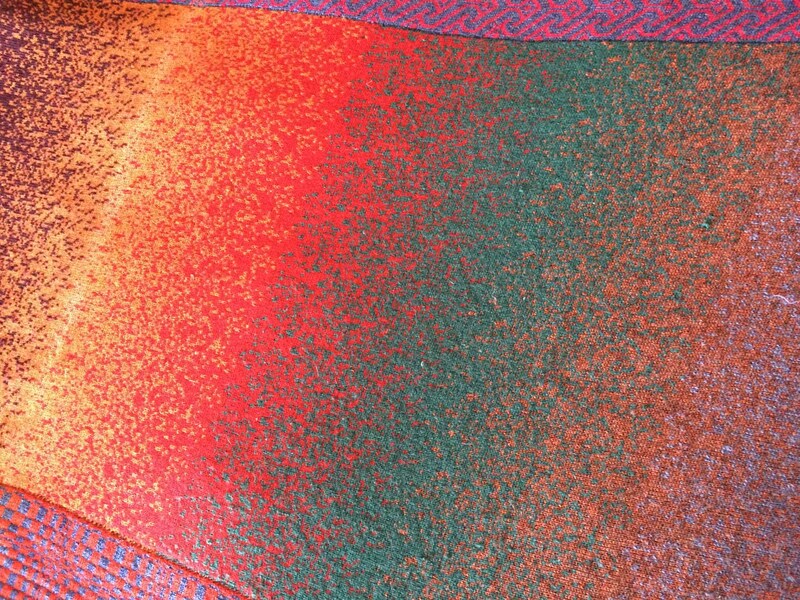 He and his bride Sohani were followers of the Bhagwan Shree Rajneesh who had enjoined his disciples to only wear red-toned colours …. I am struck that although the early weddings I’ve written about took place in hot weather in Australia and New Zealand, they give no real indication of heat. 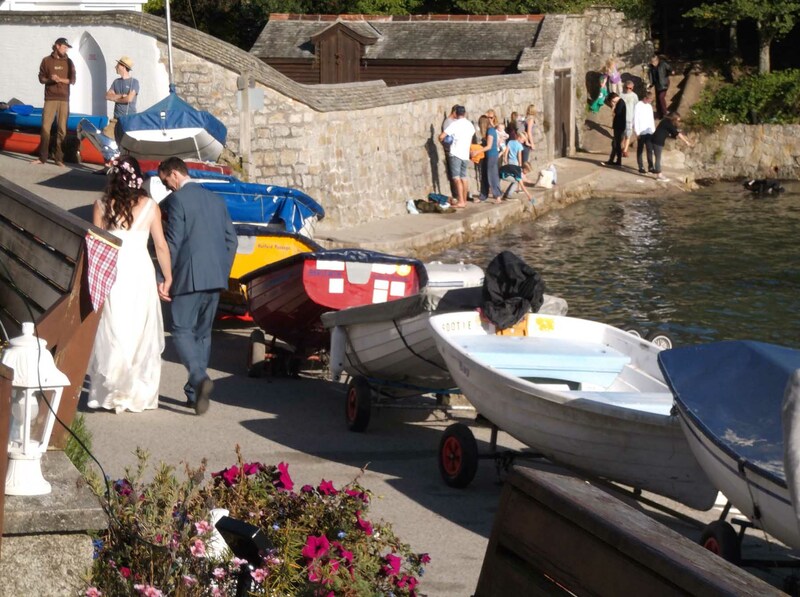 How different are modern hot weather weddings! 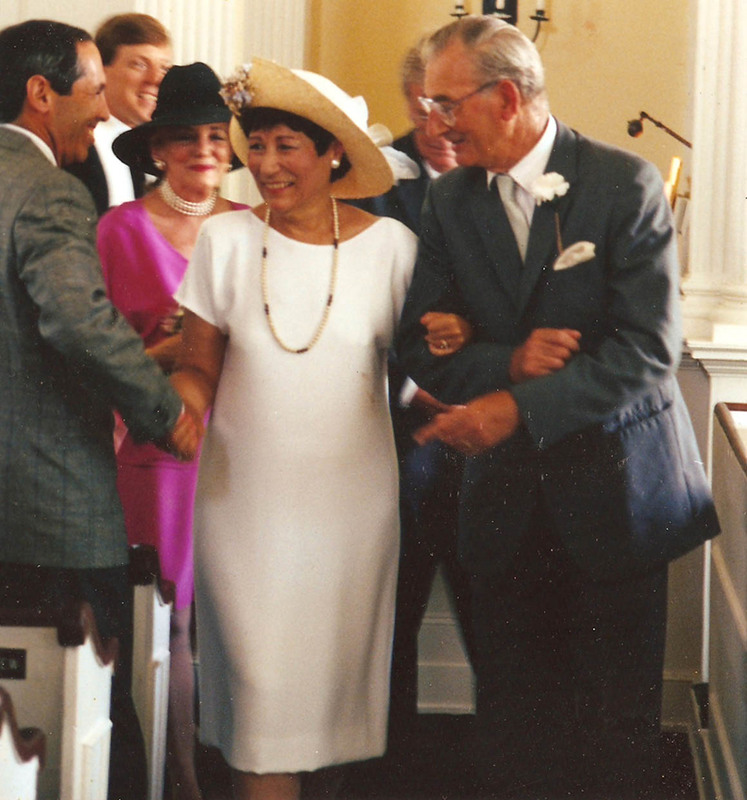 Here is my sister Marian marrying Philip on Tobago just a month earlier, but also in 1985. So elegant for its simplicity … There’s another change that creeps into the photo albums at this point: divorce followed by second – or even third marriages. Of course there has always been divorce and separation, but it was much more common at the end of the twentieth century. Sadly, my marriage to Hugh didn’t work out, and after several years of difficult marriage we called it a day – and I was a single parent, until I met an old friend now twice divorced and with a bevy of beautiful daughters … We got married in August 1991 in the Great House, Tiverton followed by a blessing in the Chapel of St Lawrence in Crediton – and I got to wear orange with my lace! This was a very “homely” wedding – our six children decorated the cake … Sent out the invites … And attended the wedding very much in their own way … I particularly love this photograph taken at the end of the day in our garden when the children were very obviously rather tired ( and several children who weren’t ours had temporarily attached themselves to our new family ) … There was another family second marriage this same year. 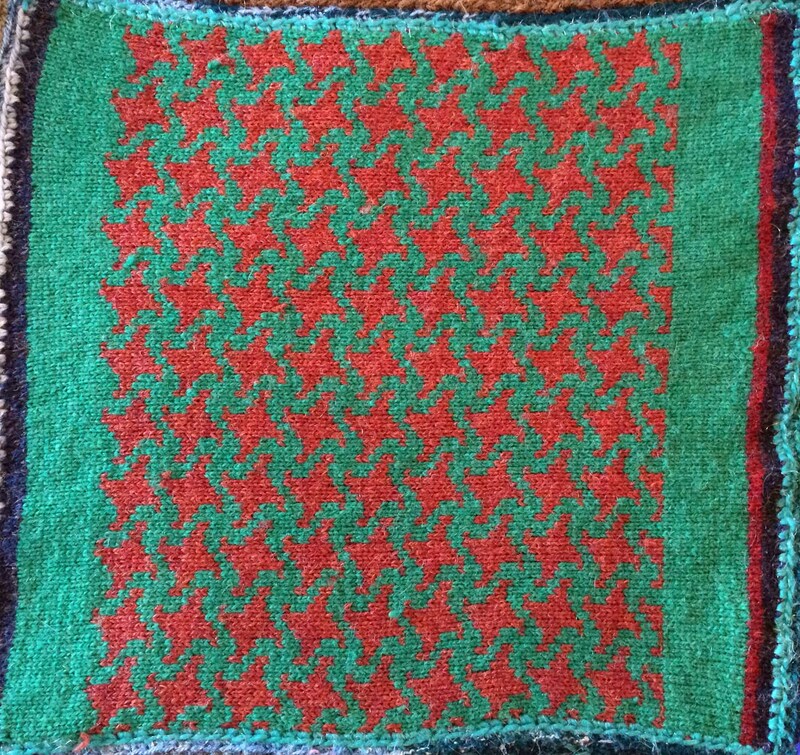 Sadly my Aunt Lee had died a few years earlier. 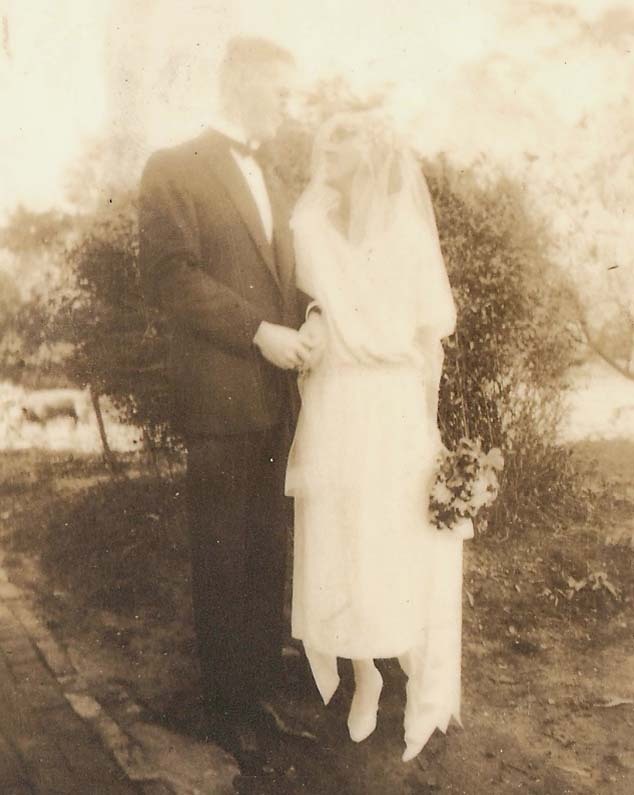 My widowed uncle met up with her old flat mate Tilla and they married in Connecticut … My sister Marian’s marriage also hadn’t worked out. 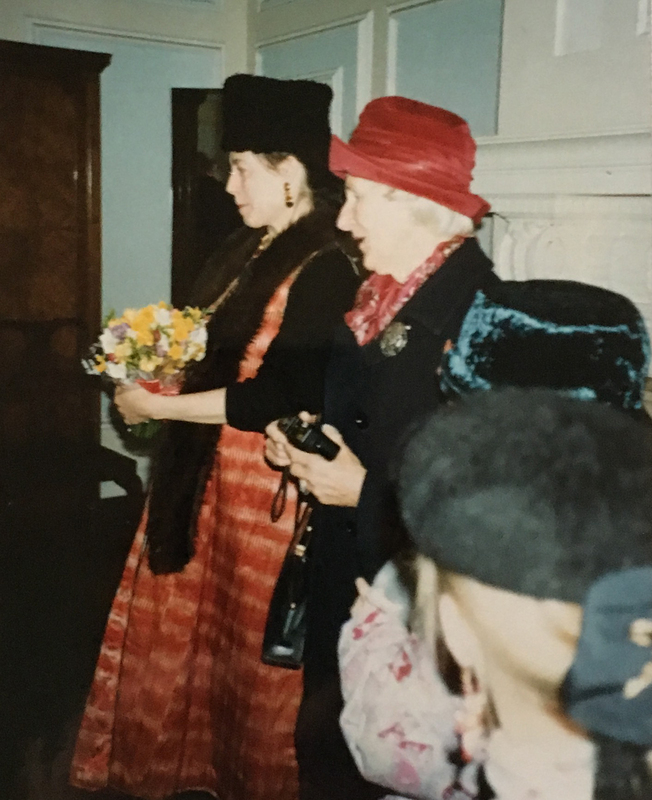 In 1993 she married Bob at Marylebone Registry office, dressed from head to toe in her own most distinctive and wonderful fashion …. Marian was heavily pregnant (their daughter was born just over a month later).. 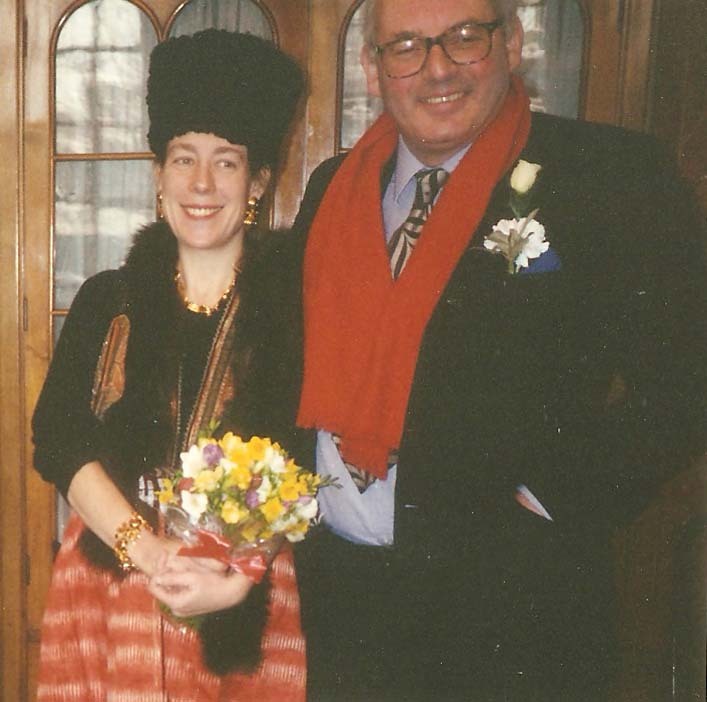 But our mother didn’t bat an eyelid (she who had objected in 1979 to my ivory piped with red) … Another distinctive marriage in 1994 – Lucy and John in Edinburgh. I think these marriages mark another change in wedding mores – it’s no longer fashionable to wear the fashion of the day. It is fashionable to wear just exactly what you like. I’d have expected all over purple from my purple passionista cousin but she kept the purple to just the bouquet and came up with this stunning cream and gold outfit accompanied by a most enchanting hat. 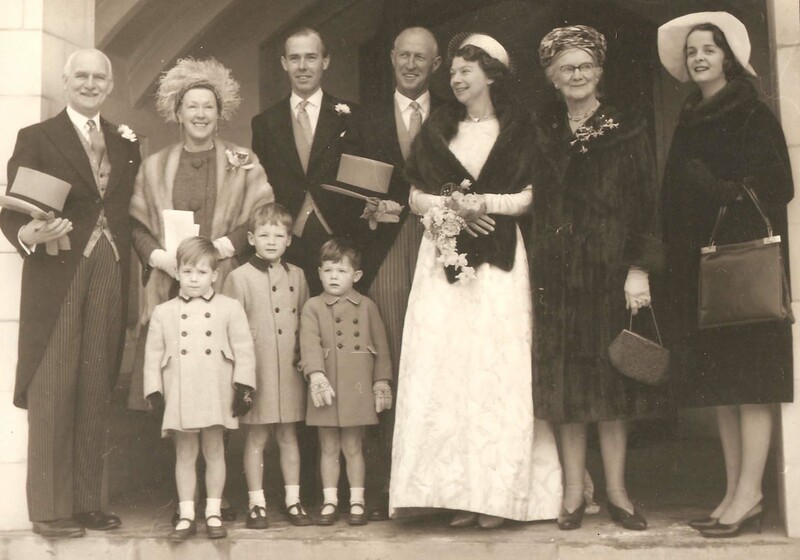 All of which suits her so well – and that is exactly what modern marriage is about … When my youngest sister, Elizabeth, wed James in 1995 at the church of St Andrew Undershaft in the City of London, she chose a more traditional style of wedding. It was a winter wedding (very early January) – and just look at that delicious touch of delicate furry warmth round her wrist … What perhaps was more than a little remarkable was the palanquin James had constructed to convey them from their Merchant Taylors’ Hall wedding reception to the train in nearby Liverpool St station … Into which this trusting bride stepped all smiles (doubtless remembering the promises of obedience she had just made to her beloved) … And off they went ….! 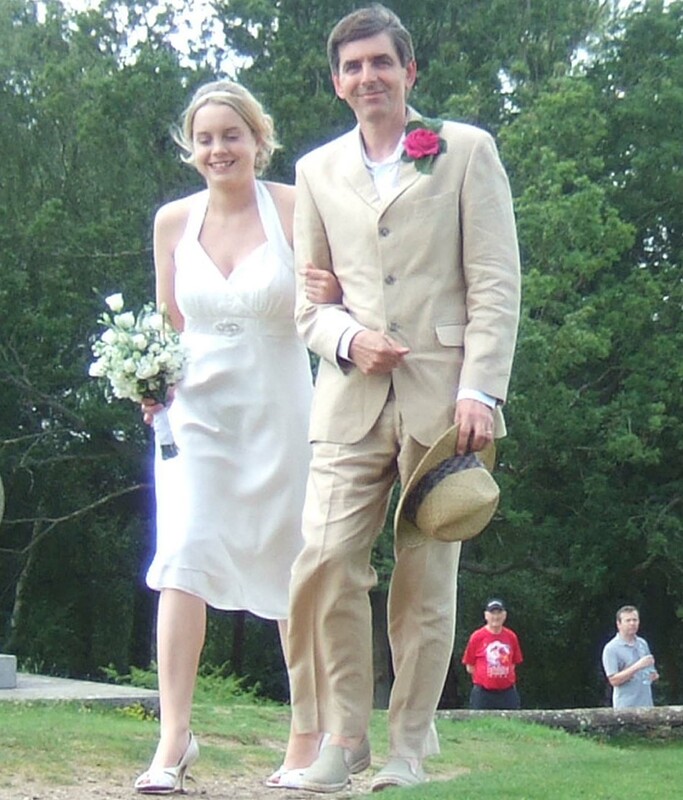 Accompanied by friends and family bearing blazing torches (which unsurprisingly completely freaked out the railway station staff) … Ten years later and there’s another generation of marriageable age. 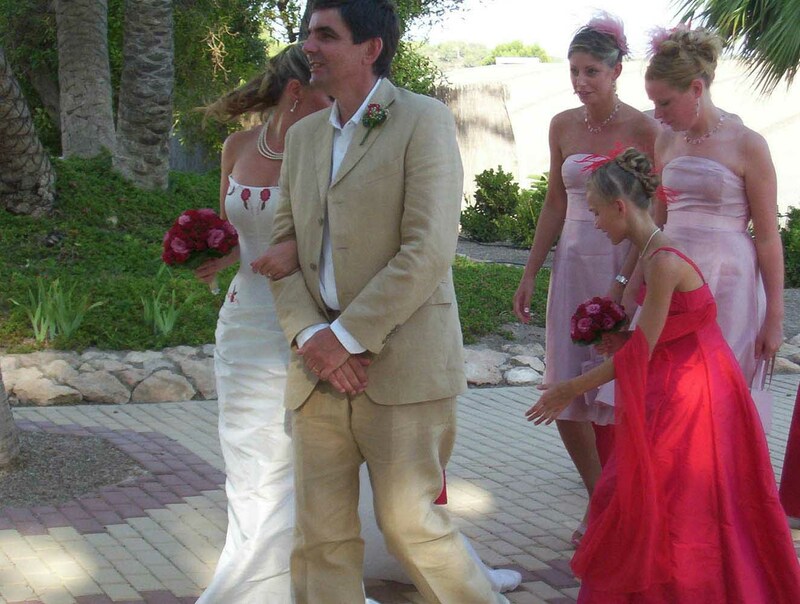 Stephen’s eldest daughter, Zaza, married Matt in a small Spanish chapel in August 2005. The bride and her accompanying bridesmaids looked just gorgeous – but those long skirts were very hot for a Murcian August wedding … Stephen invested in a stylish light summer suit – which was going to do repeat duty at several weddings as more of his daughters got married … Three years later and the suit was out again when he accompanied his younger daughter, Zacyntha, up the aisle of the tiny church of St Martha’s on the Hill just outside Guildford to marry Mike in 2008 … 2015 – and there’s the same suit as he prepared to accompany youngest daughter, Ellie, to the registry office in Helston for her marriage to Jak … They were blessed with the most beautiful September day for their wedding celebrations at nearby Helford Passage. What lingers in my memory is the sight of them wandering around the beach among the rest of the holiday makers … (you can see many more picture of their wedding in an earlier blogpost I wrote) .. September 2018 and my own daughter, Helen, got married. 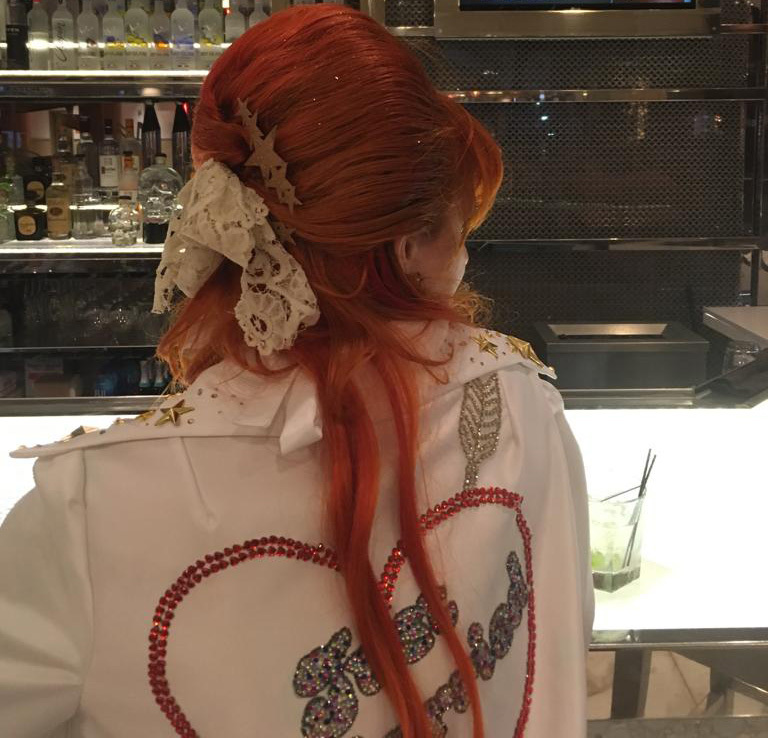 She married her Argentinian husband, Elias, in Las Vegas, in most definitely their very own style! 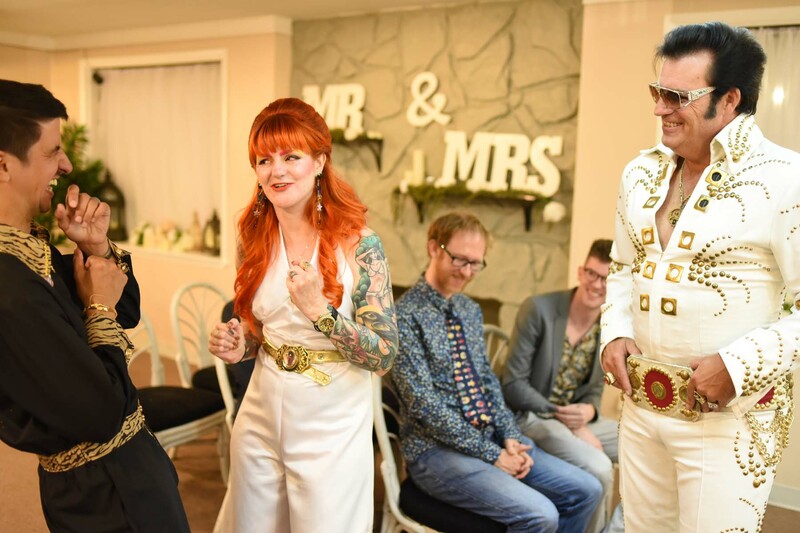 (They had made the outfits themselves – intricate beading and all) .. With an Elvis lookalike officiating … Oh and that bit of lace I took off my wedding dress? Why, there it is in Helen’s hair! 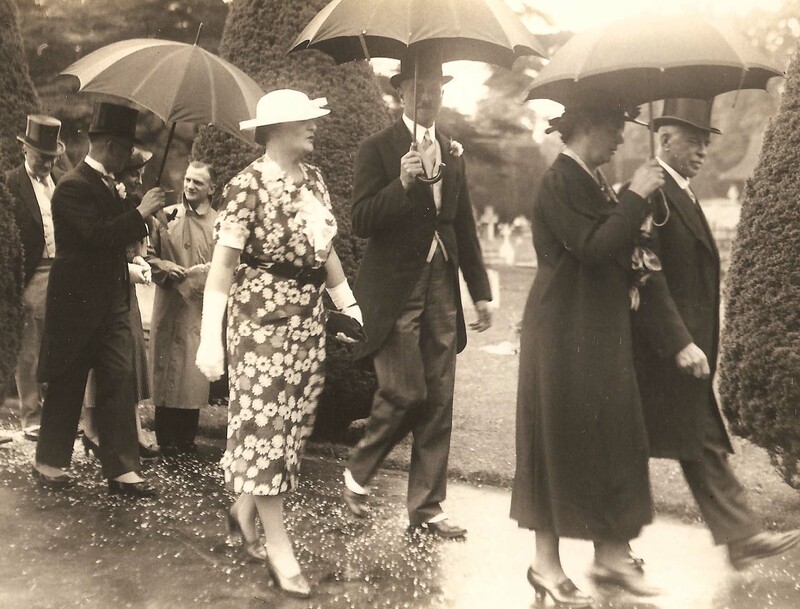 What would Charlotte Lane think of her great-great-great-granddaughter’s wedding, I wonder? I’m sure she’d be surprised – and I’m pretty sure she’d wish them every happiness …! Technical data: All images were scanned at 300 dpi with the exception of a few very good quality old photographs which were scanned at 600 dpi. The images were scanned on an old HP Deskjet Scanner F4180 which had the advantage that you could completely remove the cover. When we sought to replace it with something more uptodate, we discovered that modern scanners tend to have covers that are integral to the scanner and cannot be removed. 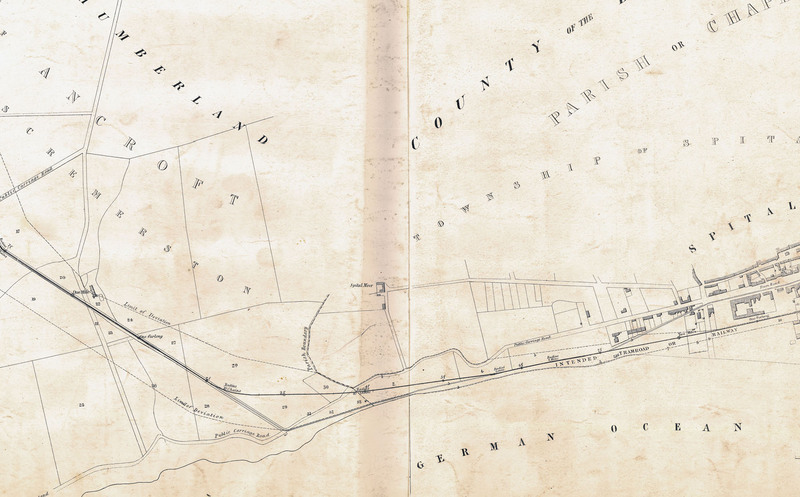 It’s very tricky to scan a large photograph album on such a scanner! 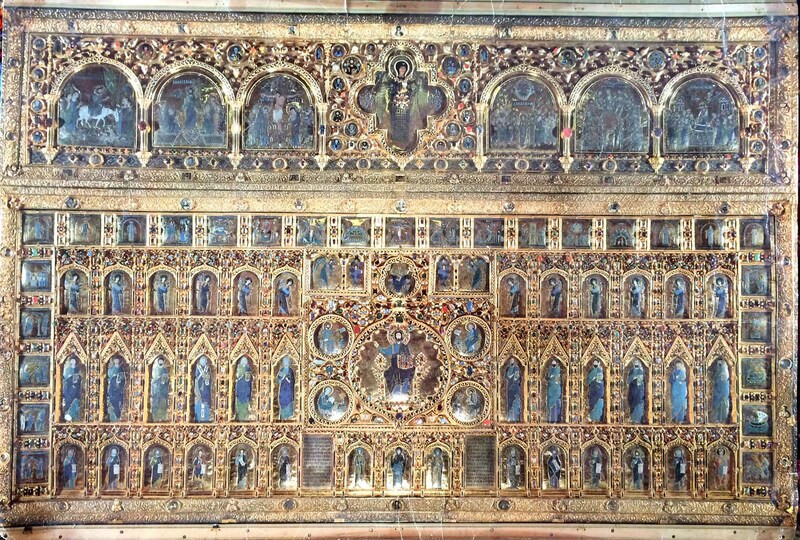 Large pictures were scanned as two or more images, and these images were edited in Adobe Photoshop Elements 2. 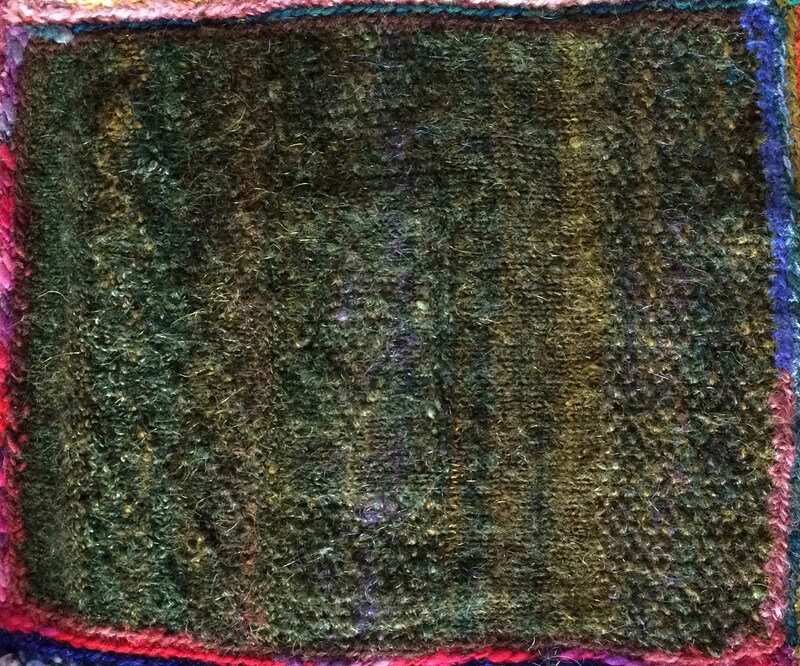 Joins were made using the program’s Photomerge facility. 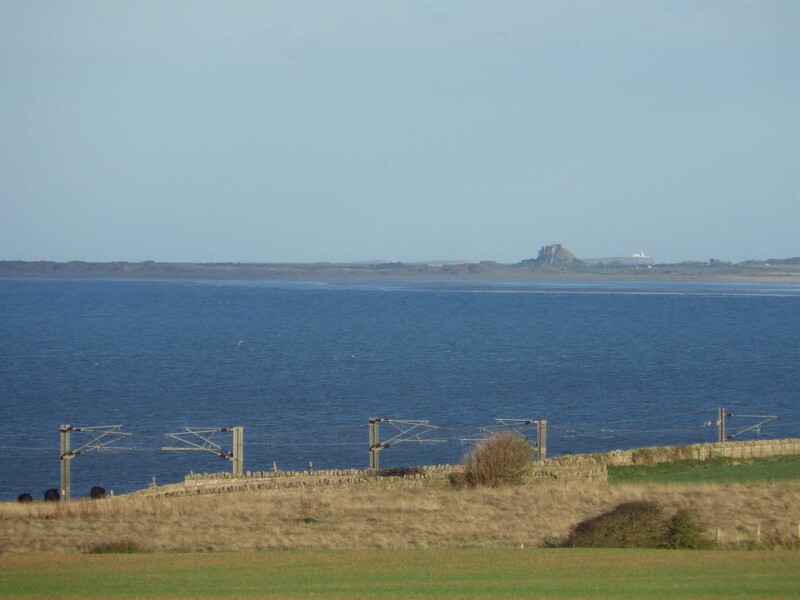 The main Eastcoast railway line snakes across our view. It is just magical. 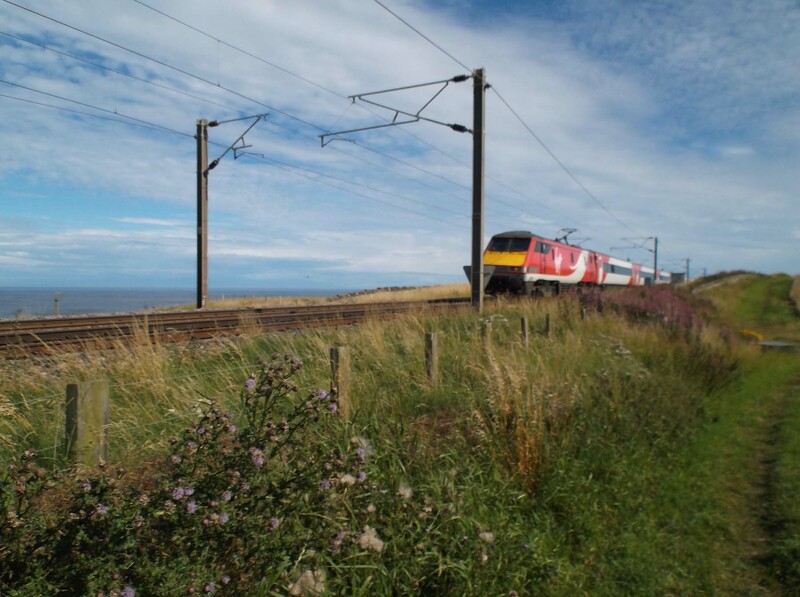 But one funny thing I have noticed is that, although we may complain about the blight of windfarms and tower blocks and pylons etc across our views, nobody ever complains about the electrical train gantries bestriding our landscape. Just look. Man-made ugliness, or what? 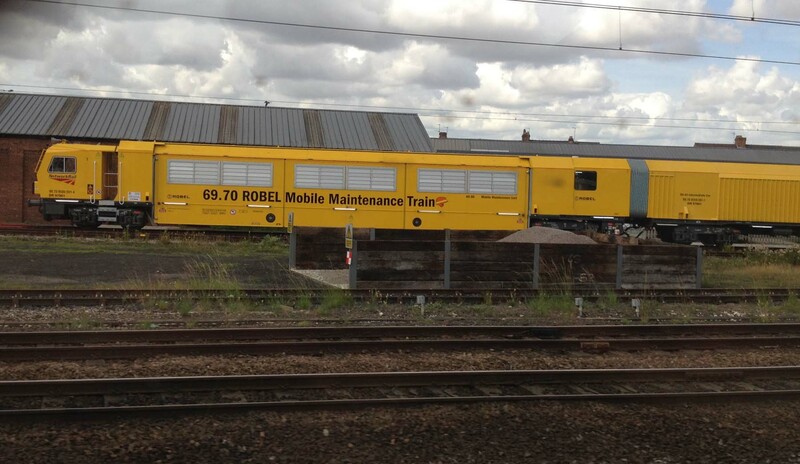 So much do we love our trains, that we forgive them almost everything. 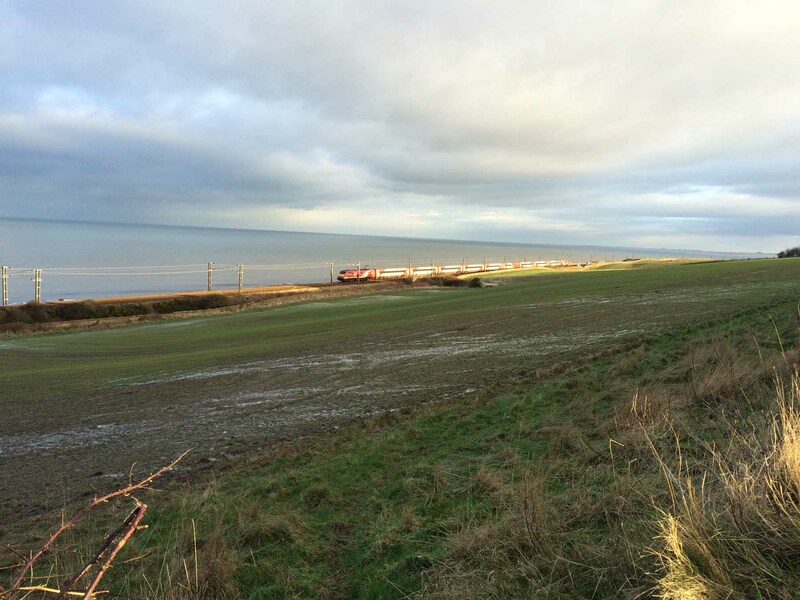 Before I came to Seaview, I could take trains or leave them. 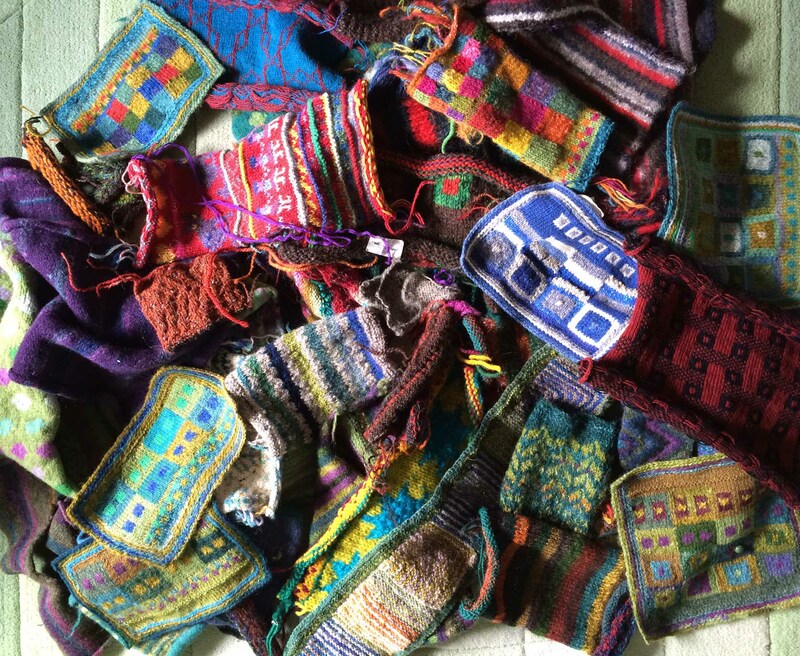 They weren’t that important to me – just the practical tools of transport. 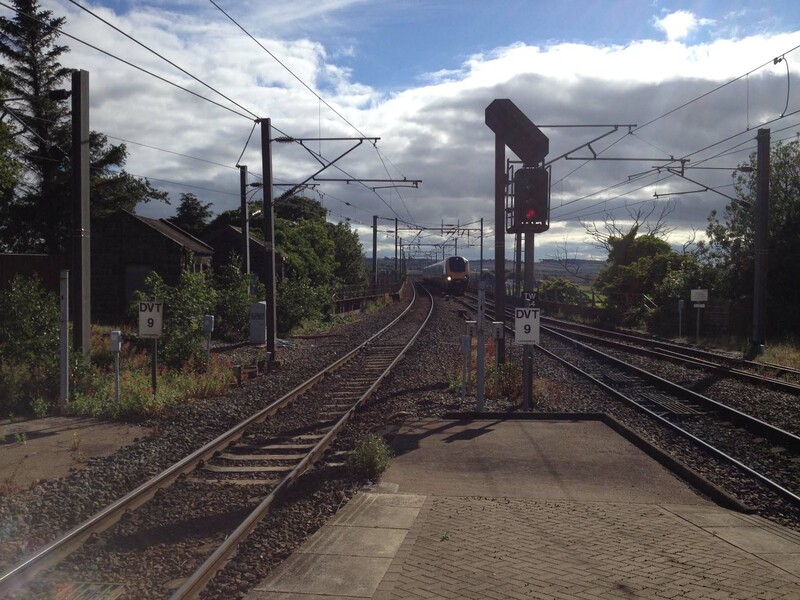 But now, I have lived at intimate quarters with trains, I have become – dare I say it – train-obsessed. It must have been an enormous engineering enterprise. 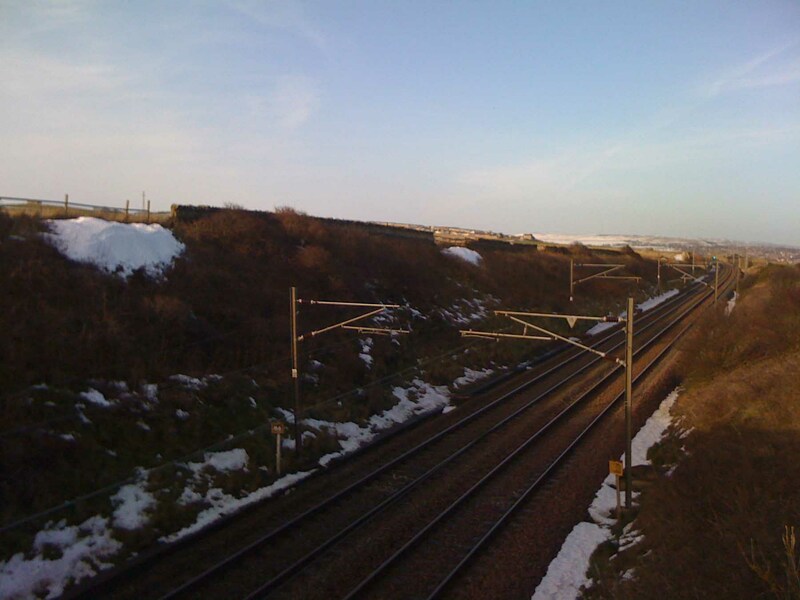 Awkward chasms had to be bridged, and at times deep gullies were excavated to level out the line along the coast. 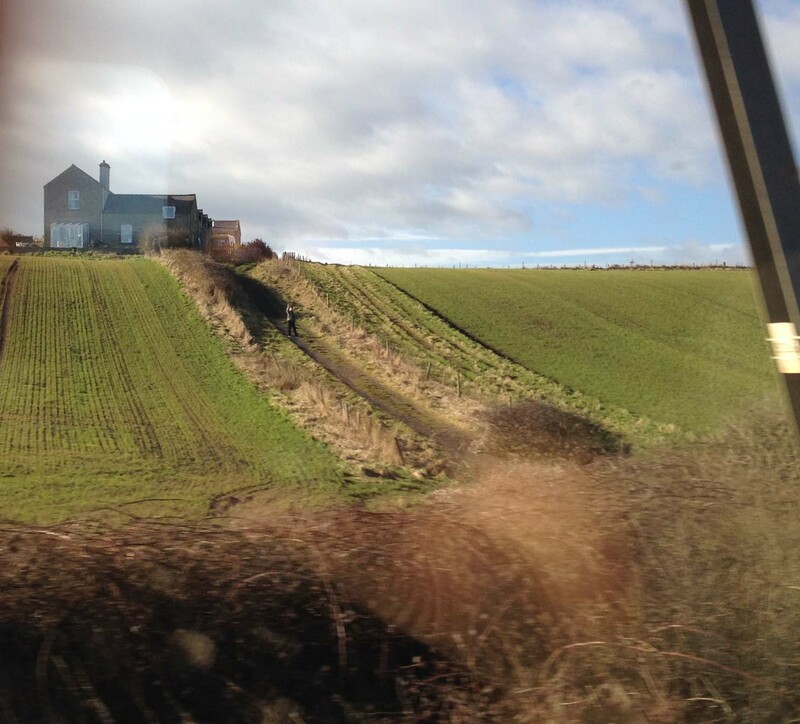 Look at the depths this part of the track (just south of our house) has been cut to! 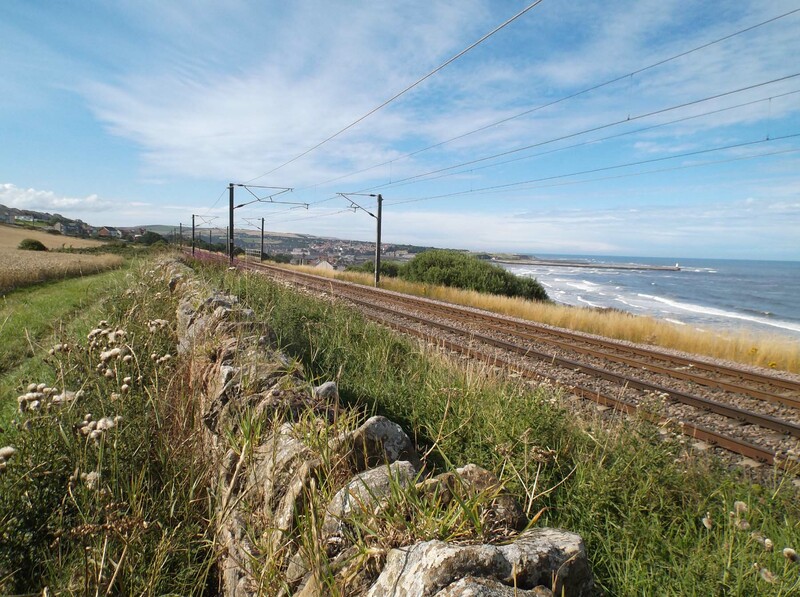 The culmination of this part of the line is the nearby Royal Border Bridge where the train crosses into Berwick and can then travel on to Scotland. 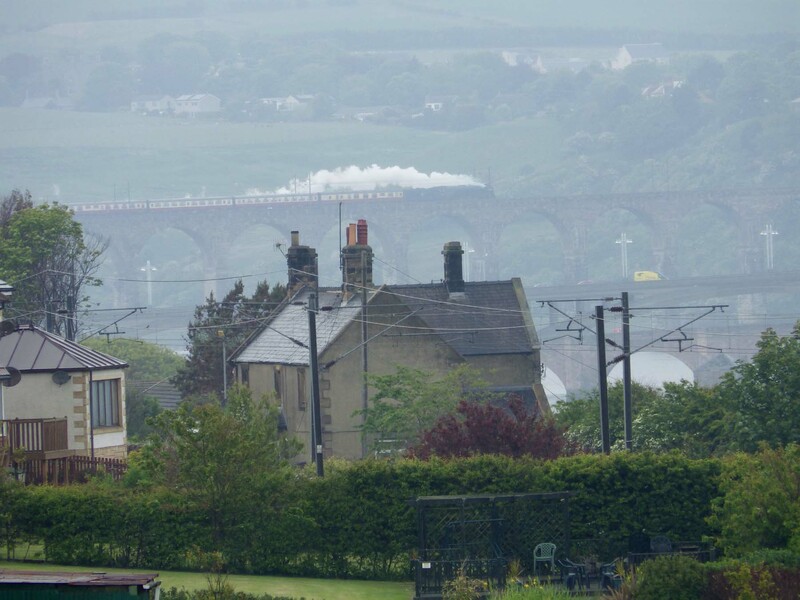 One of the bestest best sights in the locality: a steam train crossing Robert Stephenson’s magnificent 1850 bridge. 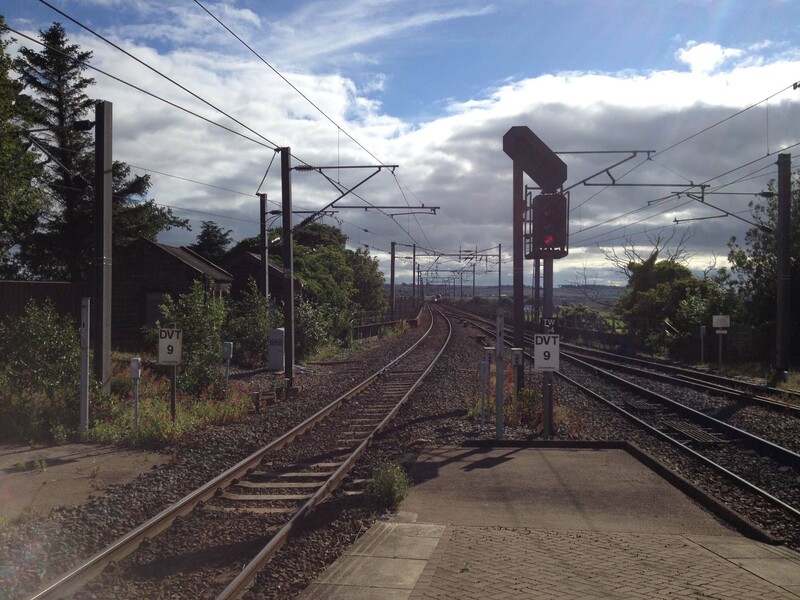 Once we started to look at the trains, we began to notice the different ones that came and went … on the road (or should that be track?) to becoming happily geeky. 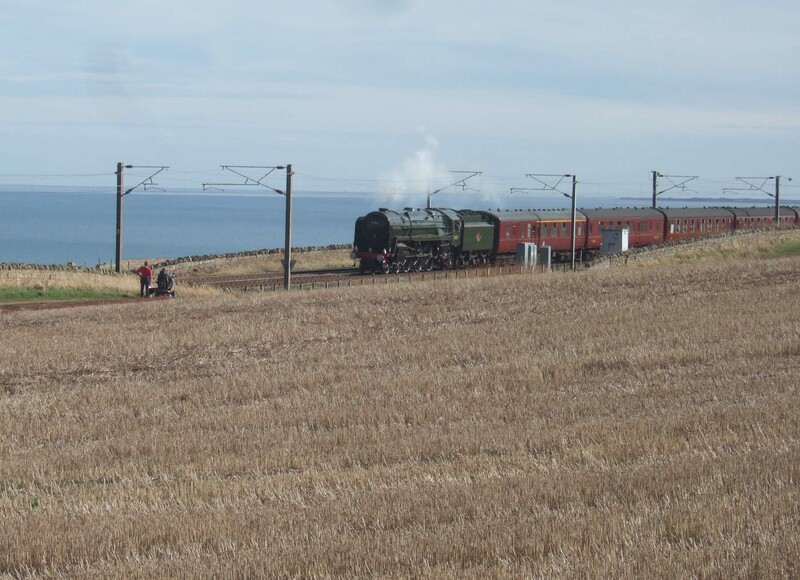 There are a lot of goods trains on the line … There are maintenance trains (glimpsed at Berwick station) … Sometimes there are old-fashioned trains taking a special tour … On a very special few occasions there are steam trains! 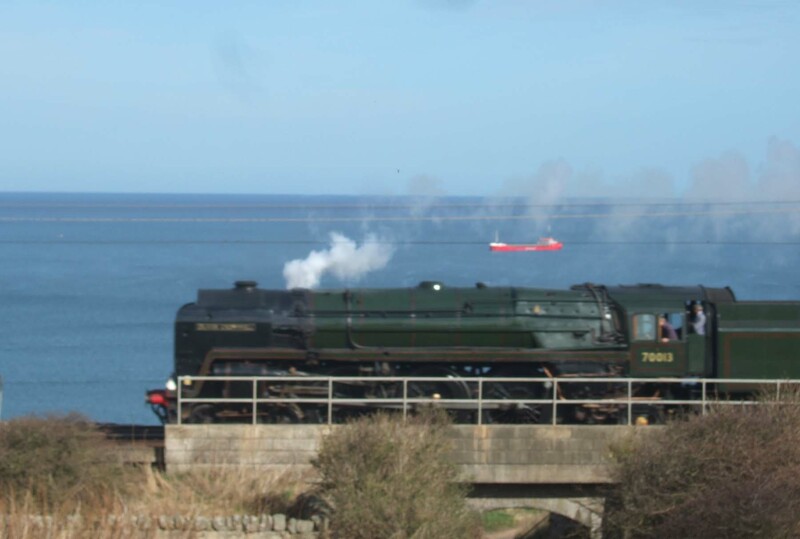 The steam trains always draw an admiring crowd. (Yes, that’s a crowd for this part of the world!) 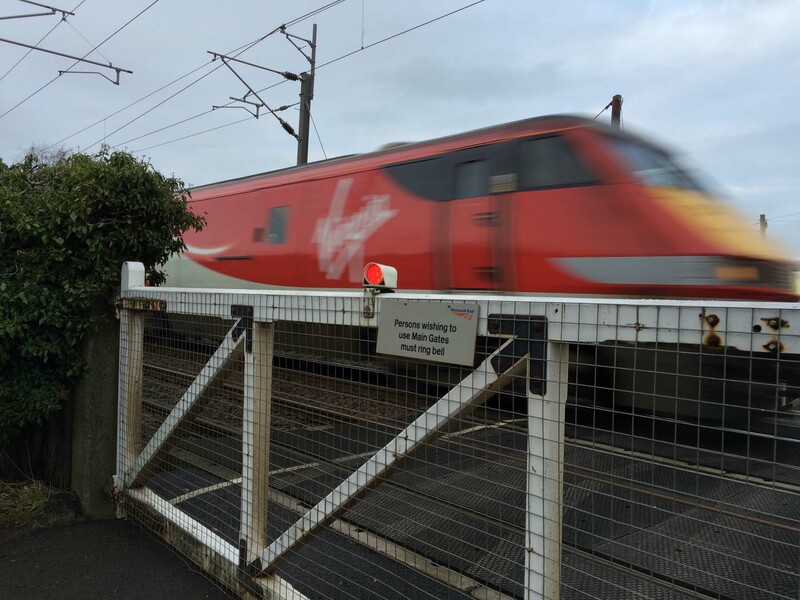 There’s something else about trains – a romance, an emotion, something beyond the fascination with the mechanical and the technical. Our friends and our family – and we ourselves – travel on them frequently as we come and go from this place, and they are wrapt up for me with the sadness of parting, and the excitement of arrival. 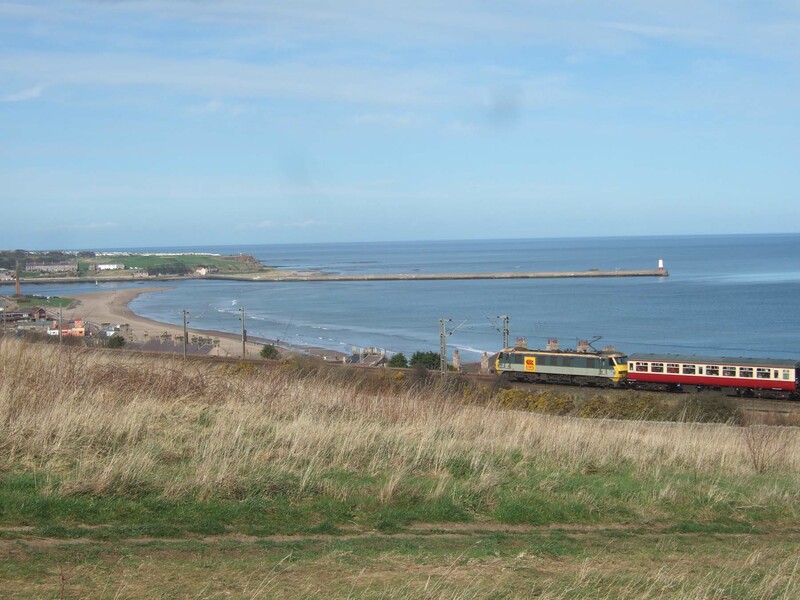 Here I am at Berwick station one sunny autumn day, waiting for a train to arrive from London, bringing a dear visitor. 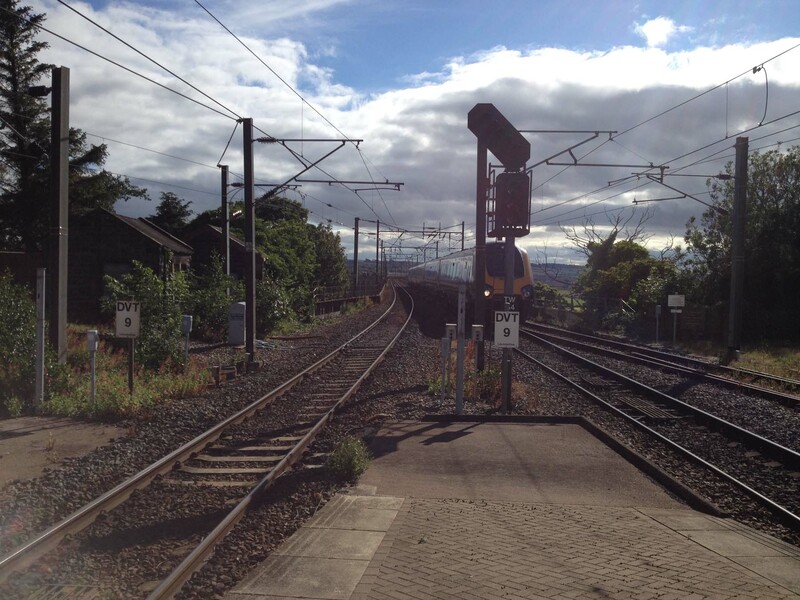 From the end of the station, you can see over the Royal Border Bridge …. 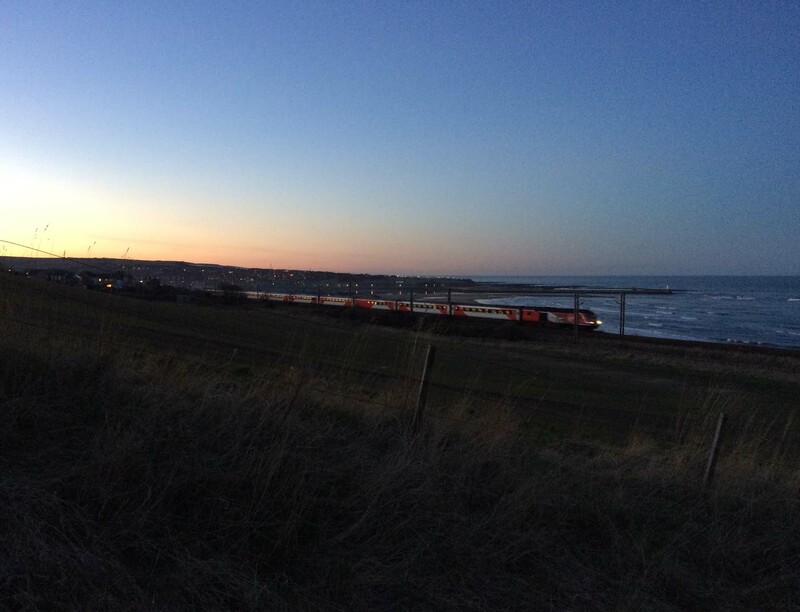 and there’s the first glimpse of the train approaching … Clearly visible now … So exciting – nearly there! Conversely, there are departures. 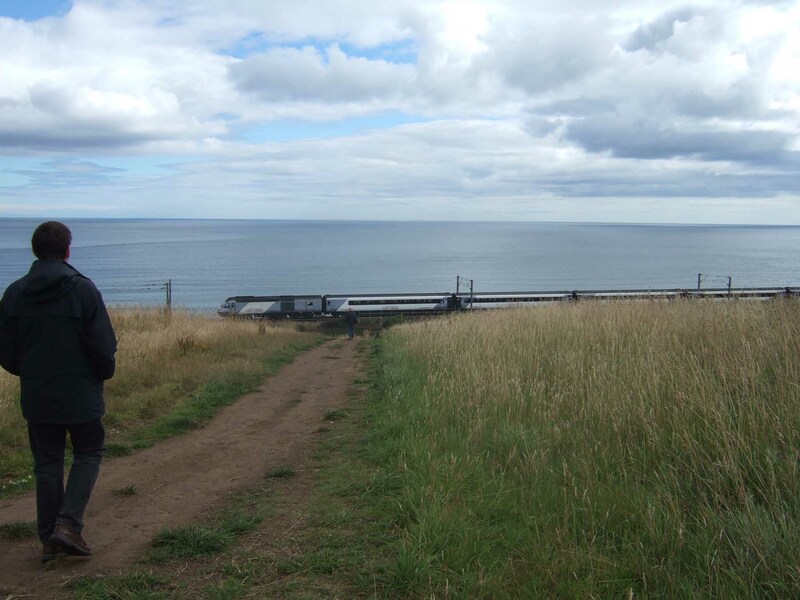 We always go down the hill to wave goodbye. On one visit to London, I managed to capture Stephen waving to me as the train gathered speed. 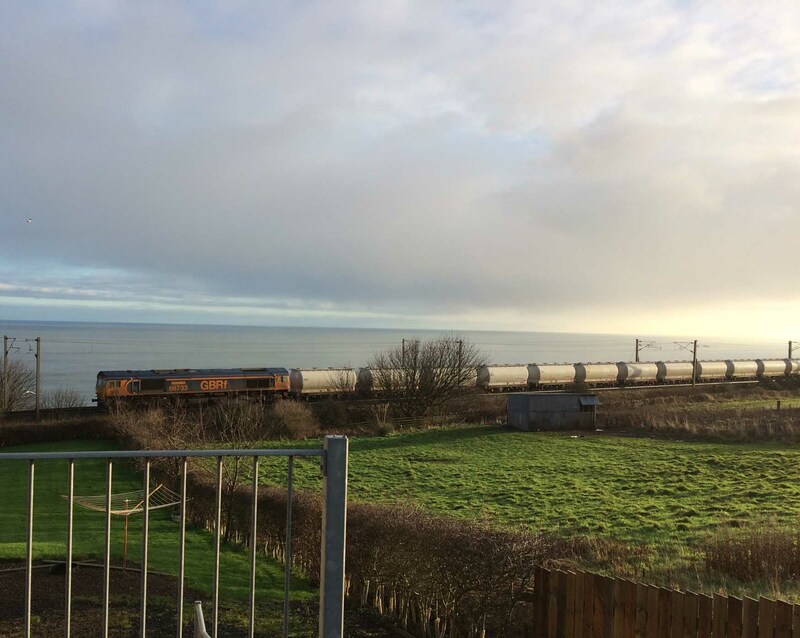 My children came to visit last weekend for my birthday, and now you have to imagine me, standing in the gloaming where Stephen was in the photo above, waving goodbye to the train carrying them back to London. Bon voyage! 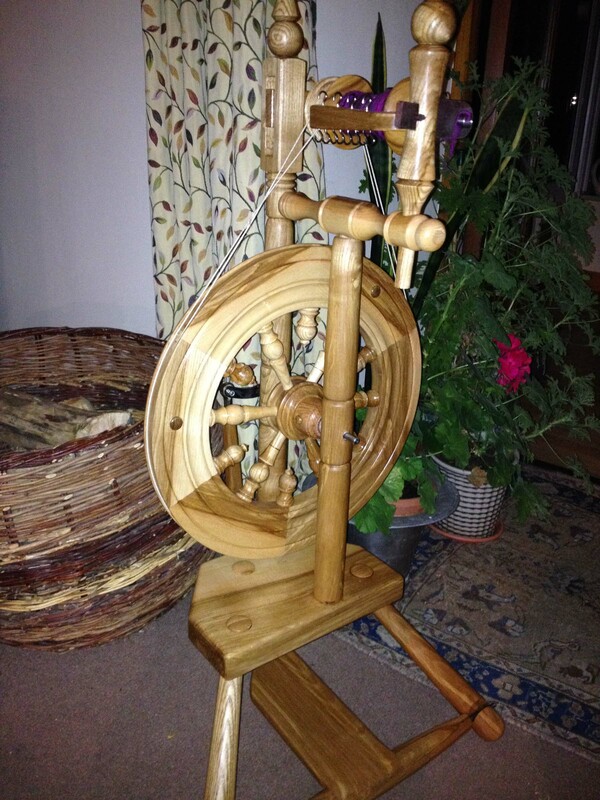 I have a new spinning wheel! 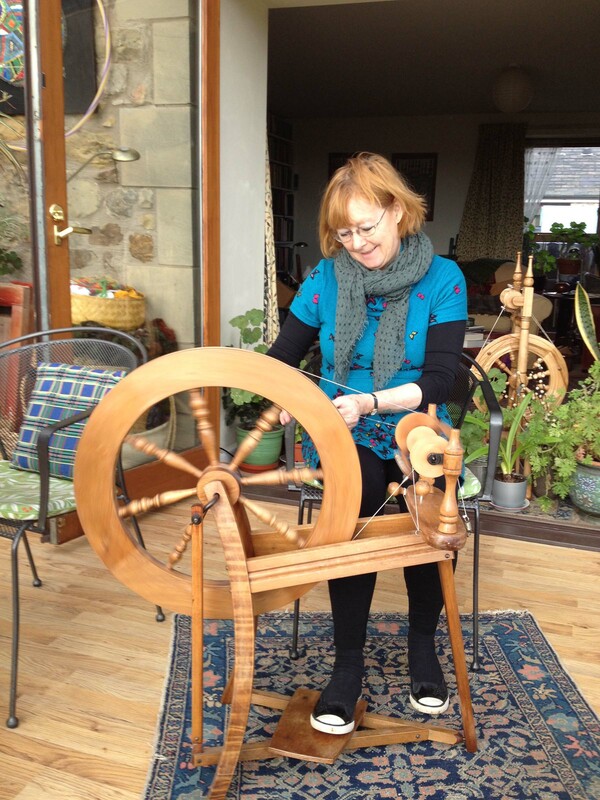 It is a beautiful little ash wheel, handcrafted by Rod Grant of Innerleithen Spinning Wheels. So elegant to look at and it spins like a dream. Those of you who know me will understand how much this means to me. 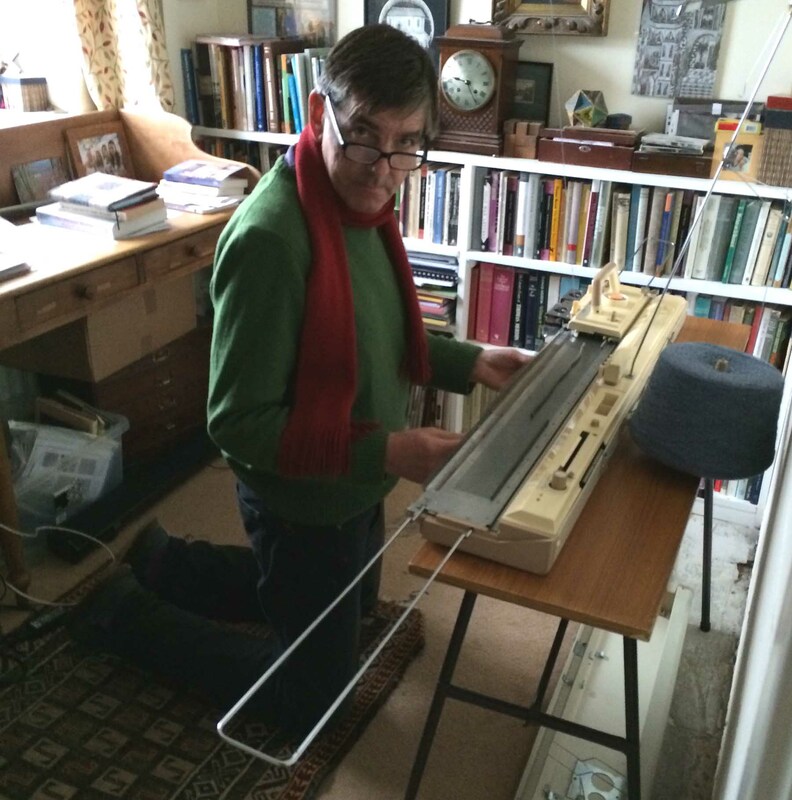 However, it is also time to say good bye to my old Ashford spinning wheel which has been my good friend and comforter for nearly 30 years. 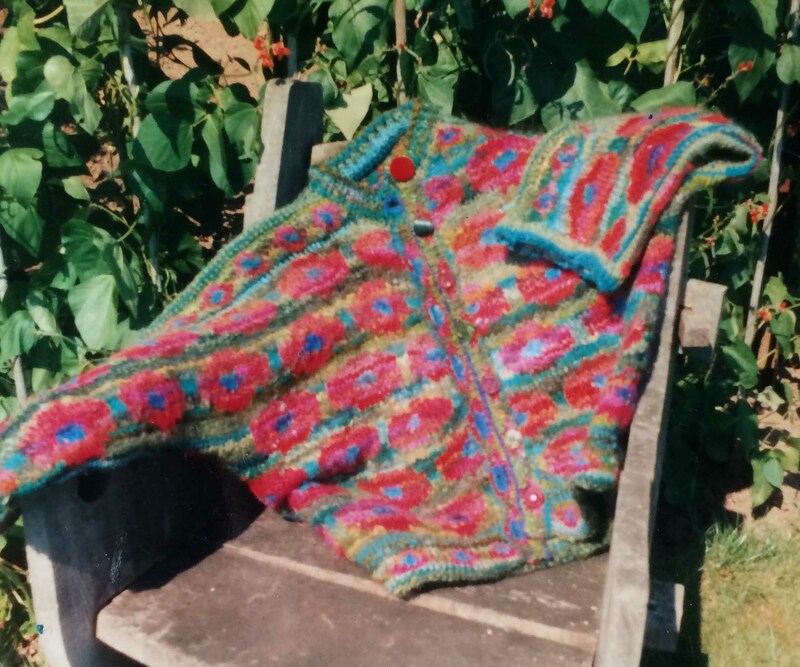 The Ashford came as a great boon to me at a very difficult time in my life. I had just parted from my first husband, Hugh, and was at home most of the time, single parenting, with two very small children and little opportunity to get out of the home. 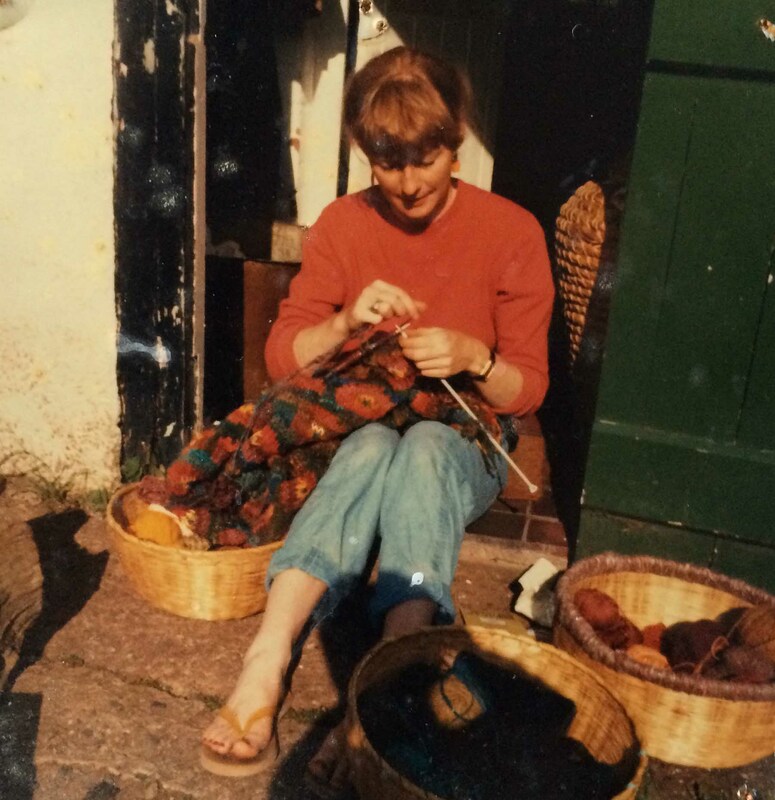 My dear friend and neighbour, Eileen Seddon (then President of the Devon Guild of Weavers, Spinners and Dyers), saw that I needed distraction, and taught me to spin – and found me a spinning wheel. 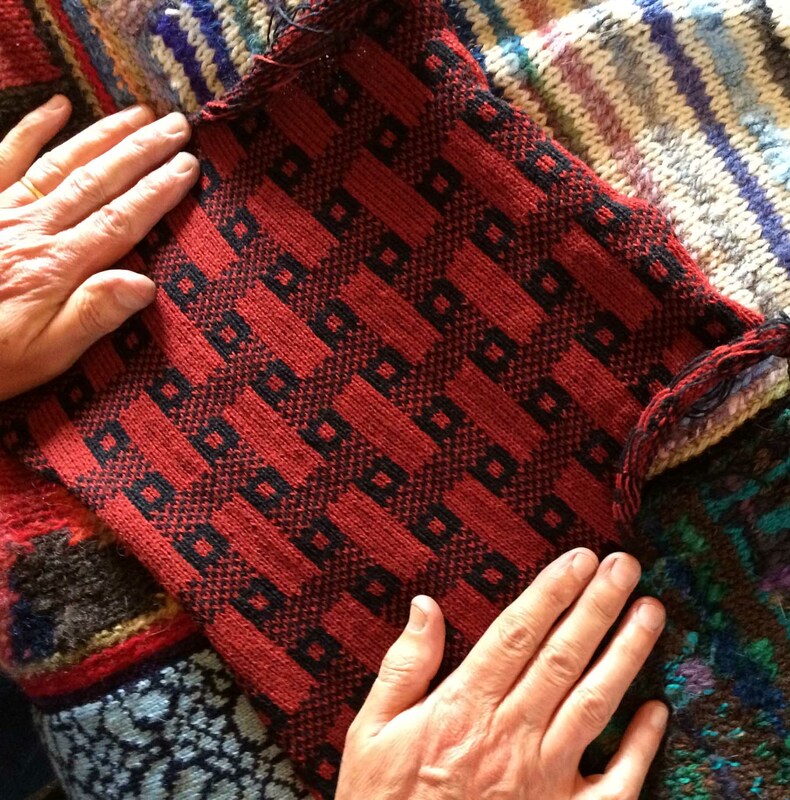 It came from another member of the Devon Guild of Weavers, Spinners and Dyers who was forced to switch to an electric spinning wheel because of arthritis. I had a brief lesson from Eileen, and I was away! – couldn’t stop! – up until the early hours of the morning spinning and spinning! 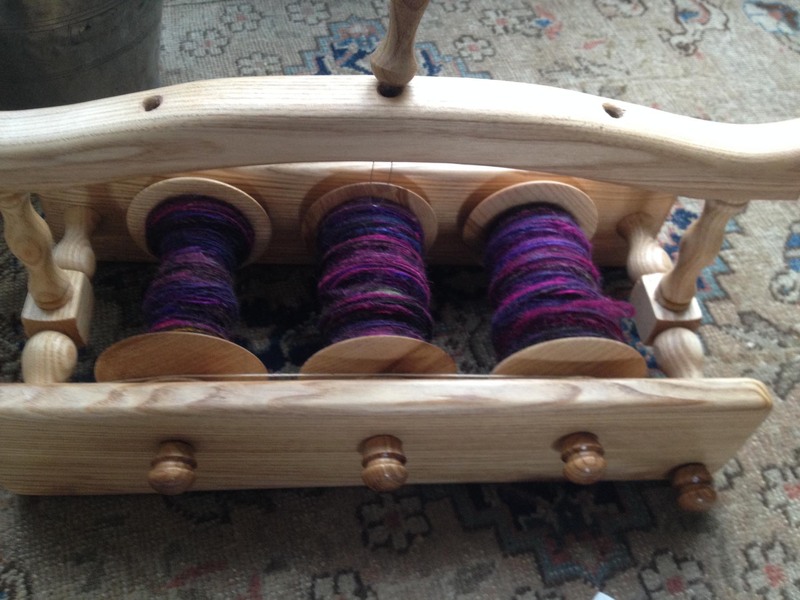 I had to stop eventually because I had filled all the available bobbins and didn’t know how to ply. 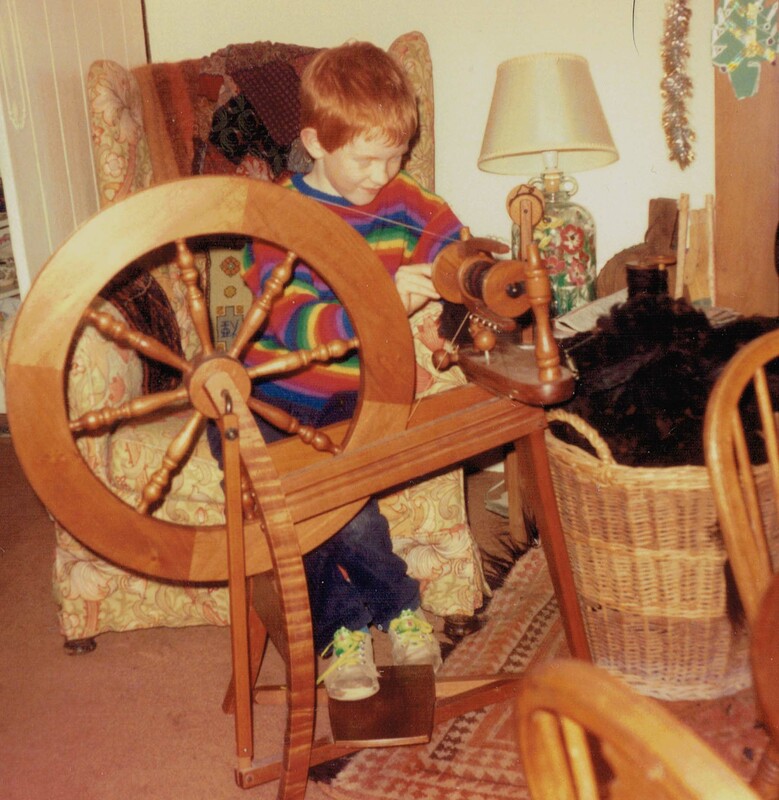 I was so very enthusiastic that I would take my spinning wheel everywhere with me. 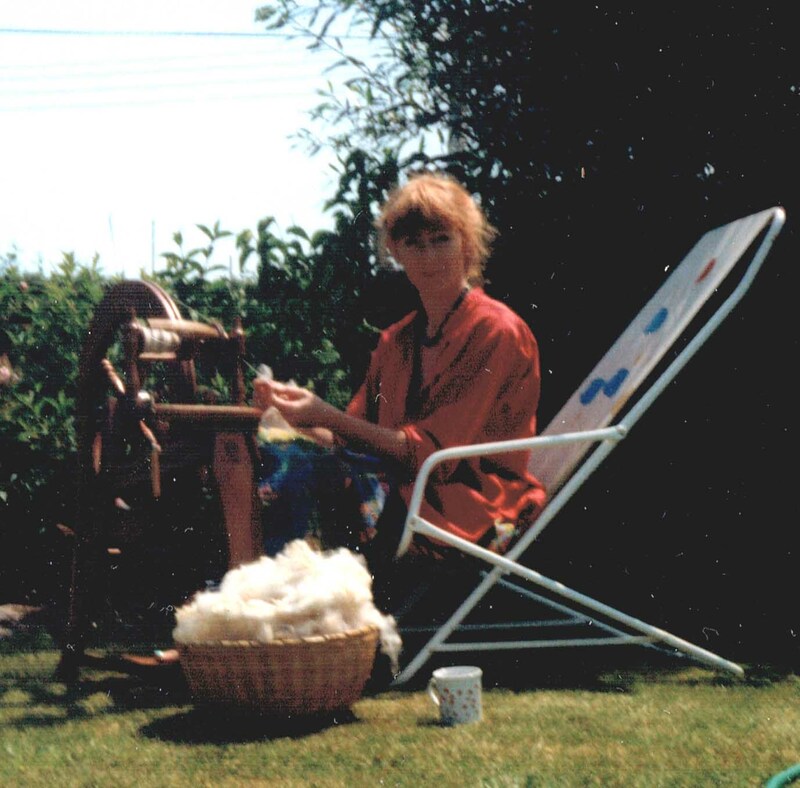 Here I am spinning in the hot Devon sun in my Shobrooke garden. 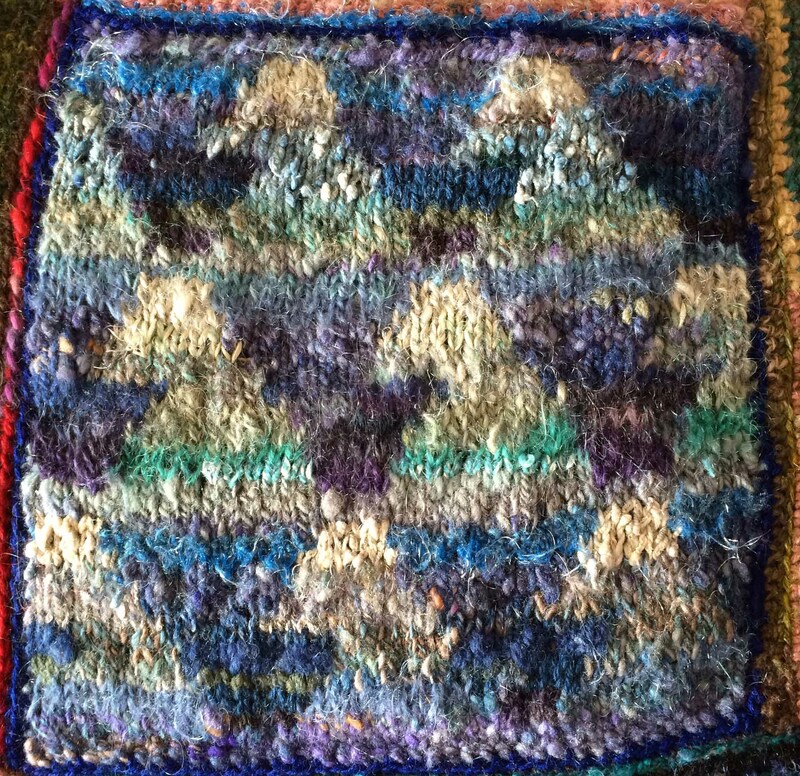 Nice basket of fleece – I think it is probably one of the first complete fleeces I ever purchased, a lovely Shetland sheep called Charity, who was raised most lovingly in the glorious pasture land of Stockleigh English. 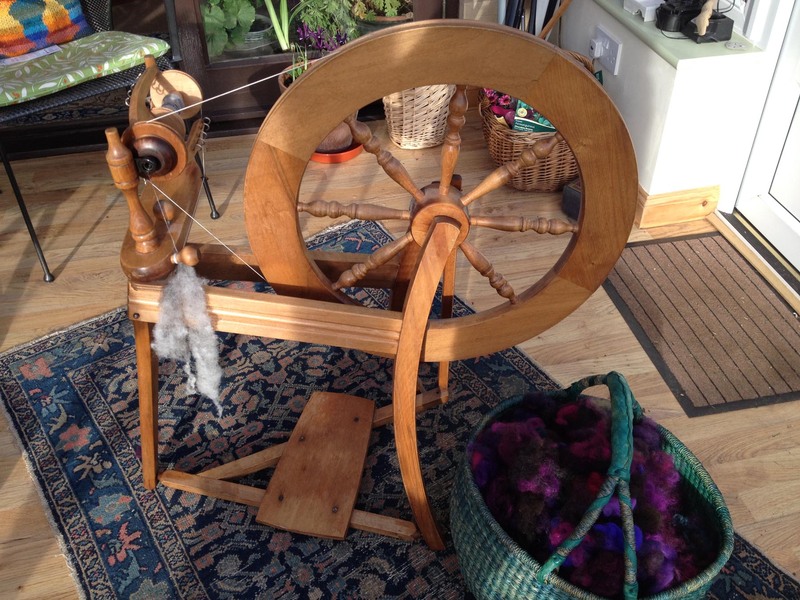 Here is James having a go at spinning in our Shobrooke home. 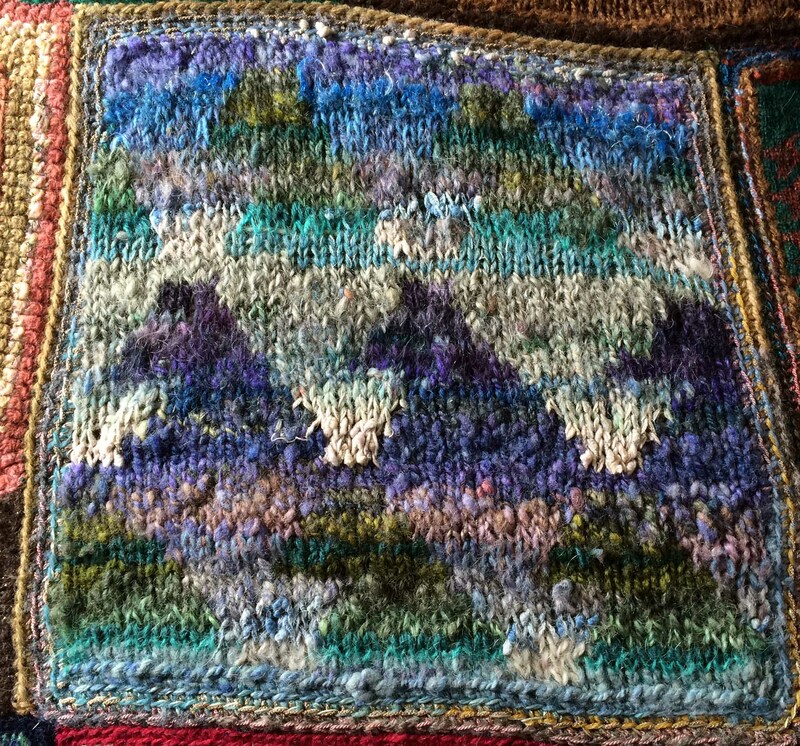 A great basket of Welsh Mountain fleece to get through there, James! The wheel has accompanied me through many travels. Perhaps its saddest time was when it was run over by our car at the Border Union Show. 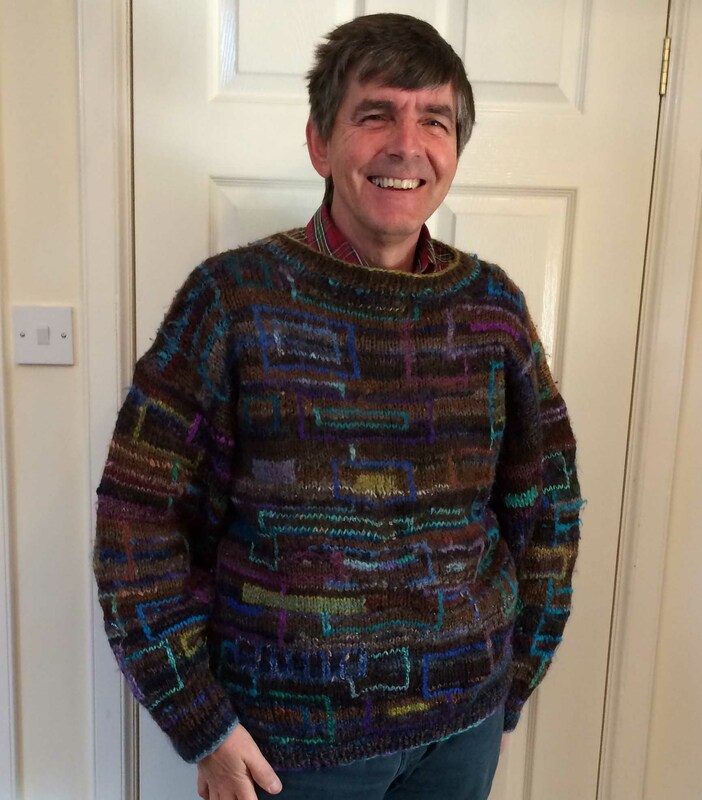 Stephen hadn’t realised where the spinning wheel was standing as he straightened the car into the parking spot, and reversed straight over and into it – crunch, crunch, crunch. I was demonstrating at the show, so the wheel had a hasty fix to make it spinnable – you can see the masking tape holding one leg together, and more masking tape binding the mother-of-all in place. 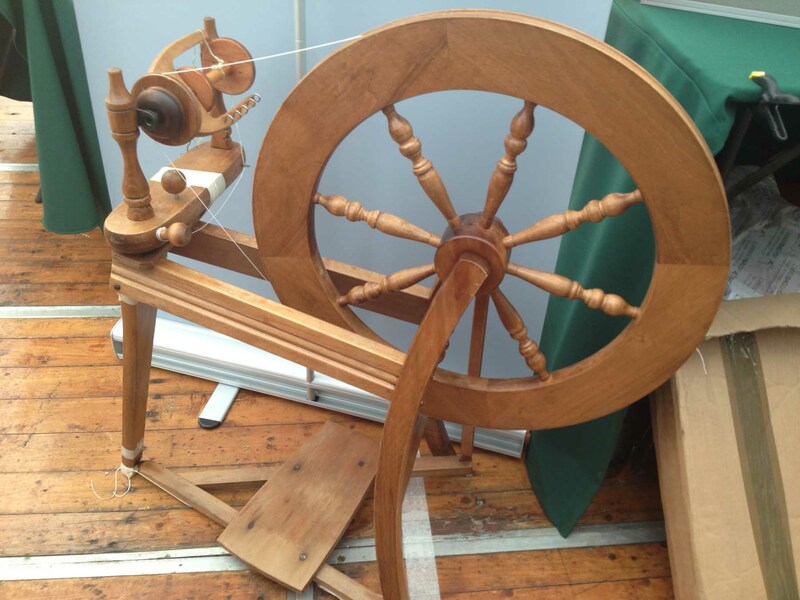 While my Innerleithen spinning wheel is the Emperor of all spinning wheels, the Ashford is a work-a-day wheel, and showing signs of wear and tear. 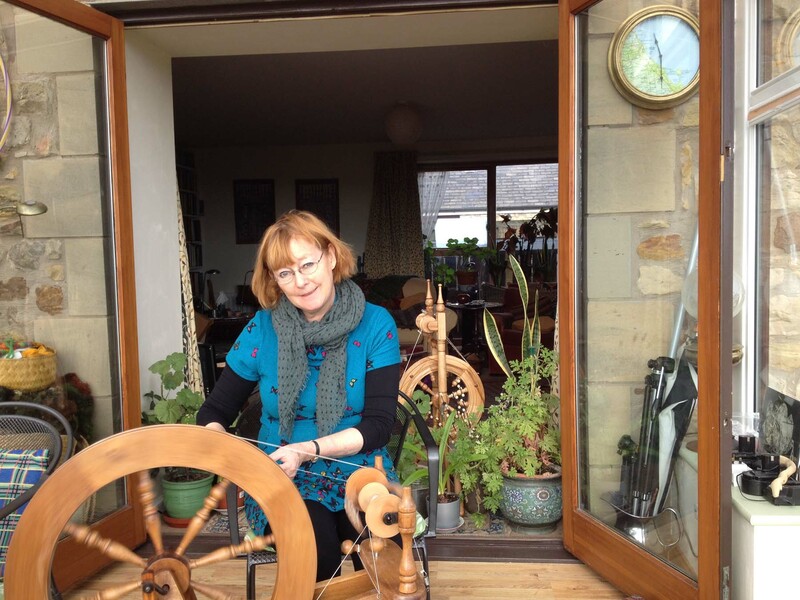 The very good news is that a beginner spinning enthusiast has given it a new home in the Borderland wilds of the Ettrick Valley. 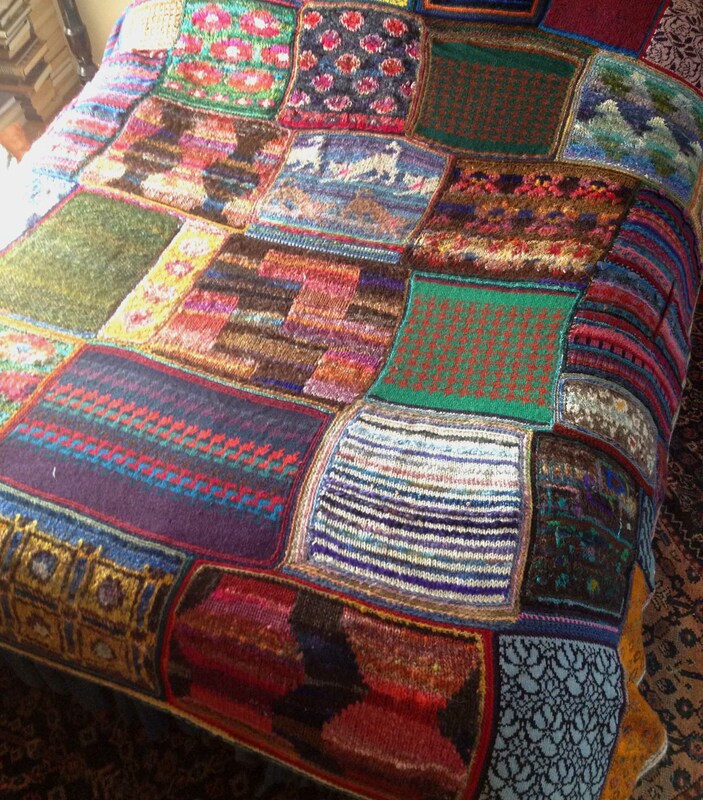 She plans to collect fleece on her walks (as I used to). 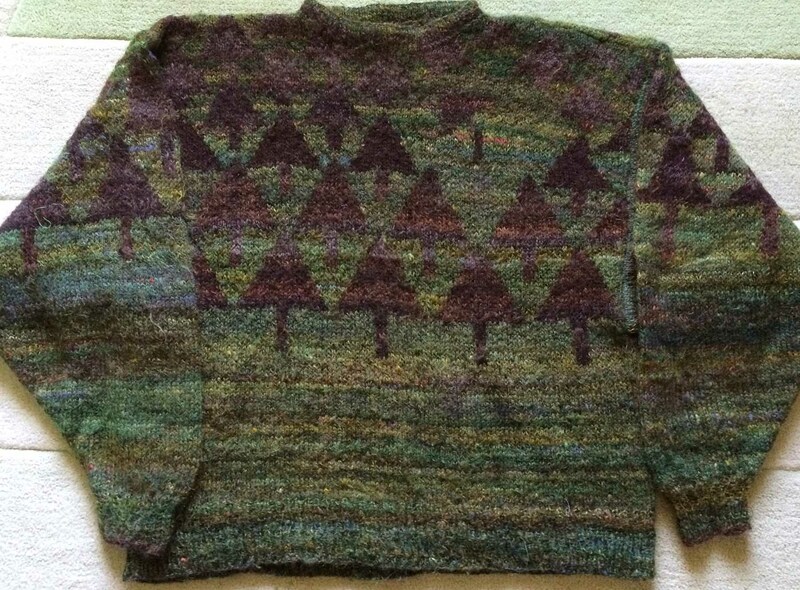 Most conveniently her wood cabin is insulated with wool and cashmere purchased from the last mill in Selkirk when it closed down. 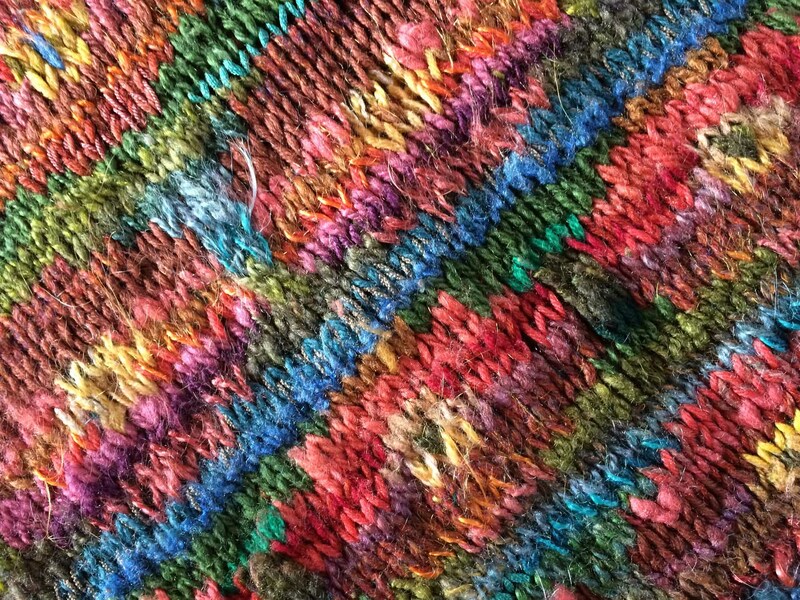 Not only does it provide fantastic insulation, but it has been dyed the colours of the rainbow! 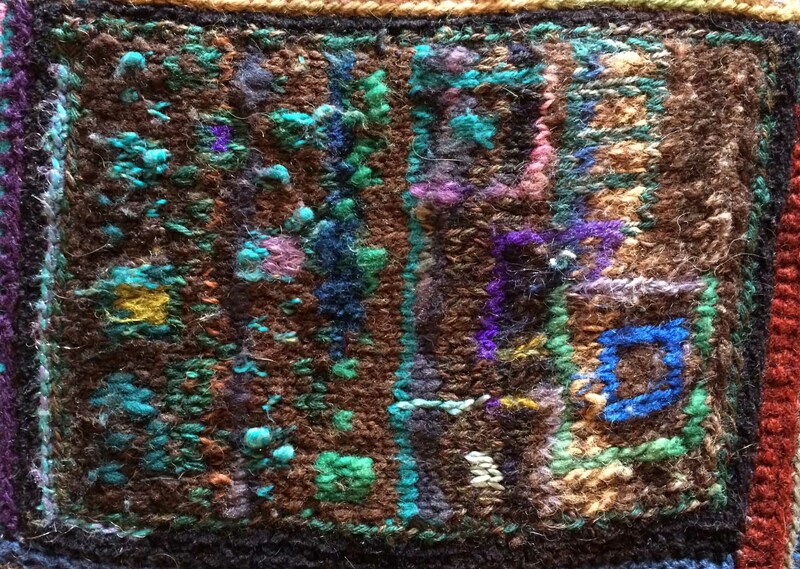 How wonderful to think of those layers of colour wrapped round her cottage. 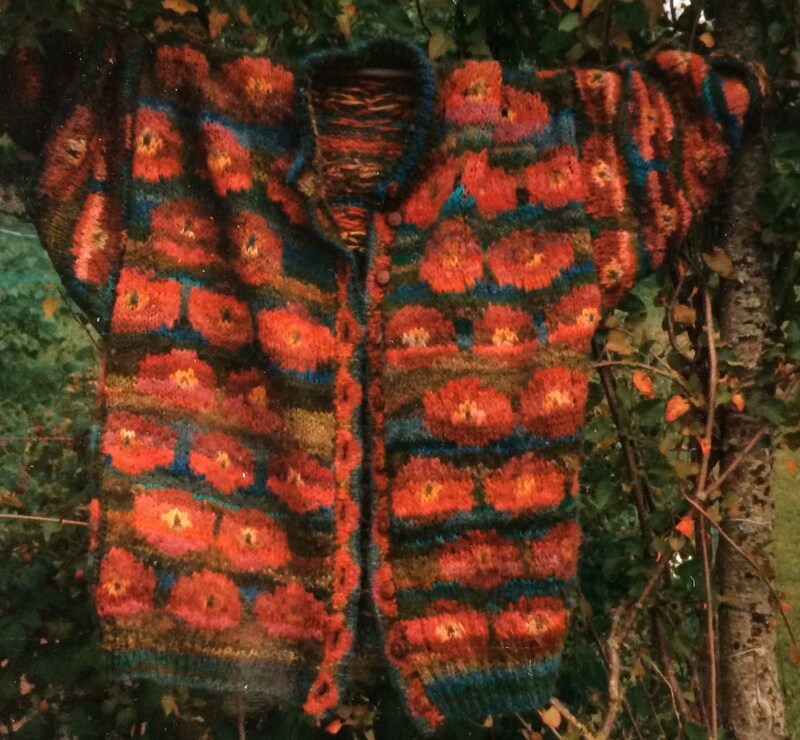 No need to worry that she will ever run out of fleece – she has only to prize a little out of the building structure! 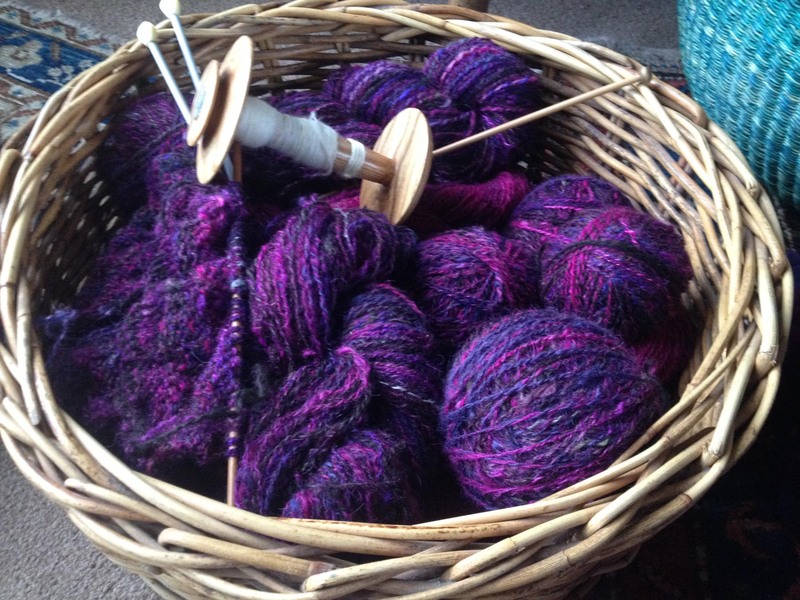 I am sure my old spinning wheel has gone to a new home where it will be much loved and enjoyed – and become part of the furniture. 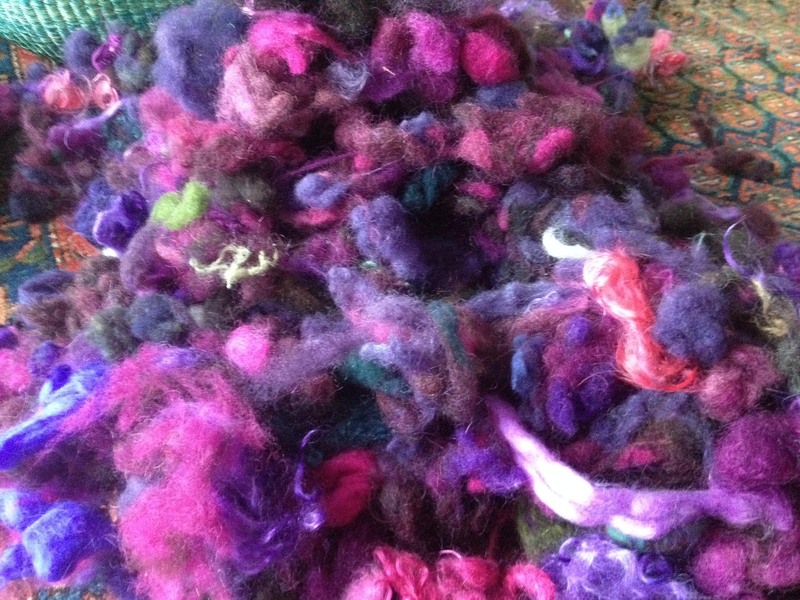 I’m spinning some pretty multi-coloured fleece myself. 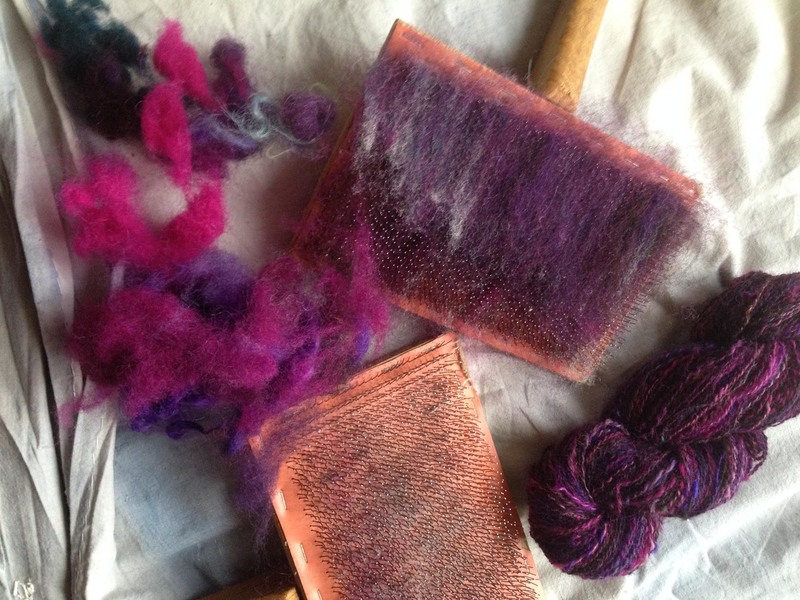 Last summer I dyed a local Jacob’s fleece these amazing pinky purpley colours. 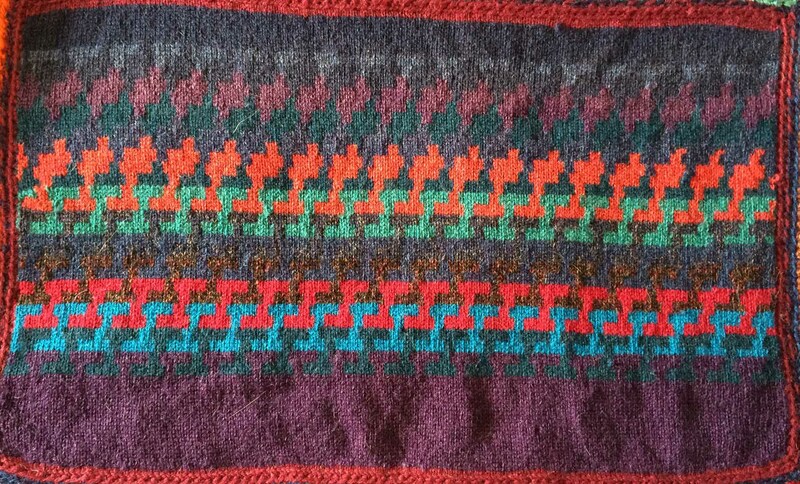 (I’ve always wanted to dye fleece this fantastic fuchsia pink! 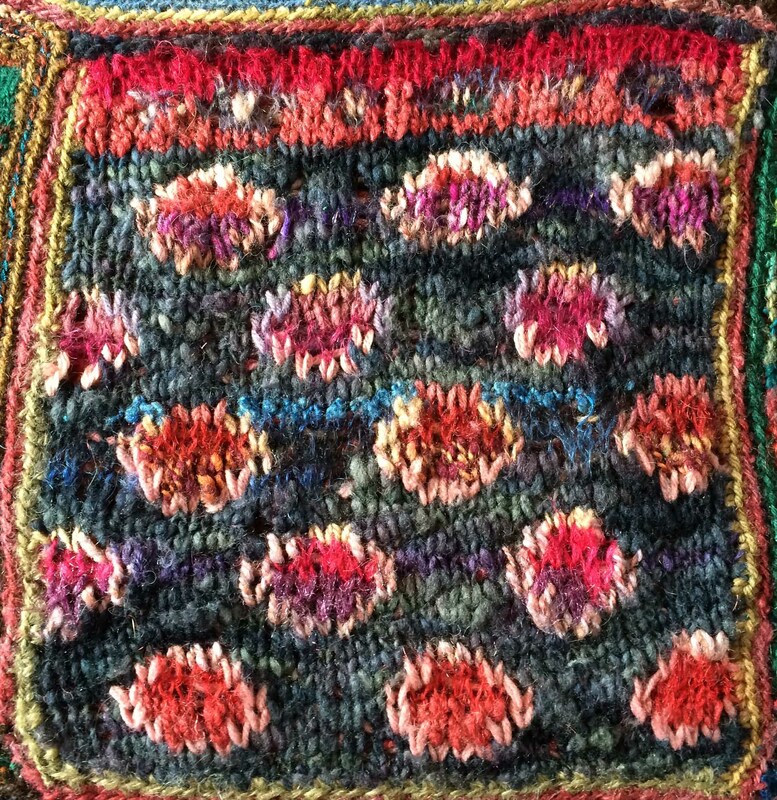 I took it with me to demonstrate at the Border Union Show, and it attracted much interest, both from sheep farmers, and little girls who rushed to handle my pink wool!) 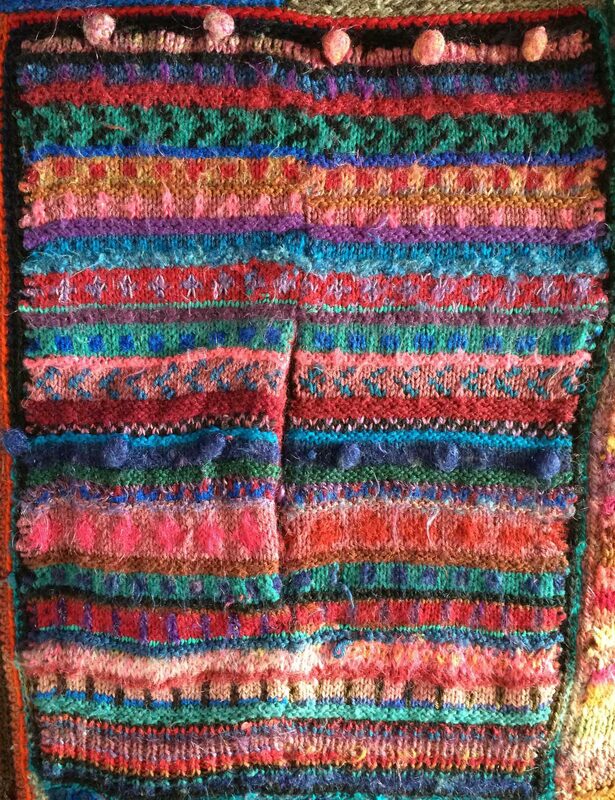 I’ve added mohair and silk to the mix, and a few bits of other coloured fleece for extra effect. 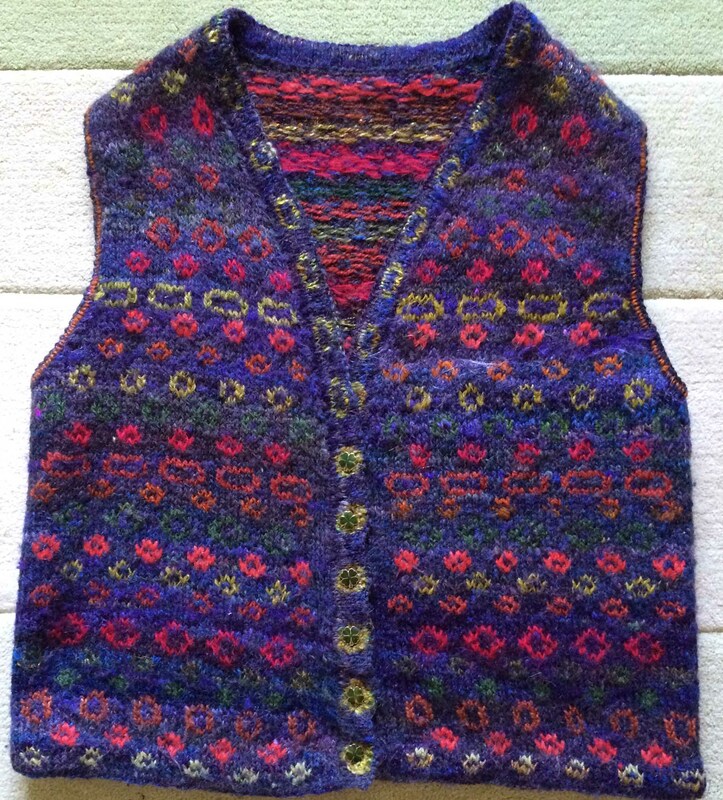 Out come my old carders… Rod Grant has made me a fine ash Lazy Kate to accompany the new spinning wheel. It’s not just a very elegant piece of equipment, it’s brilliantly designed. 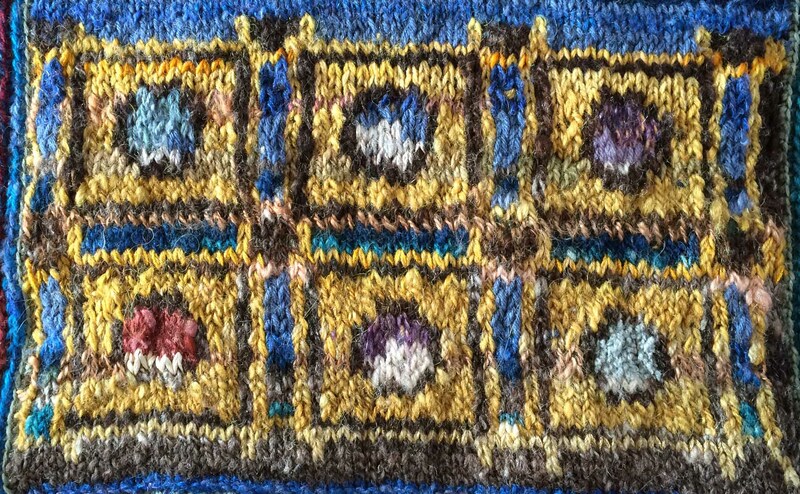 You may just be able to see the tension string stretched over the bobbins to make sure they release the yarn evenly and smoothly. 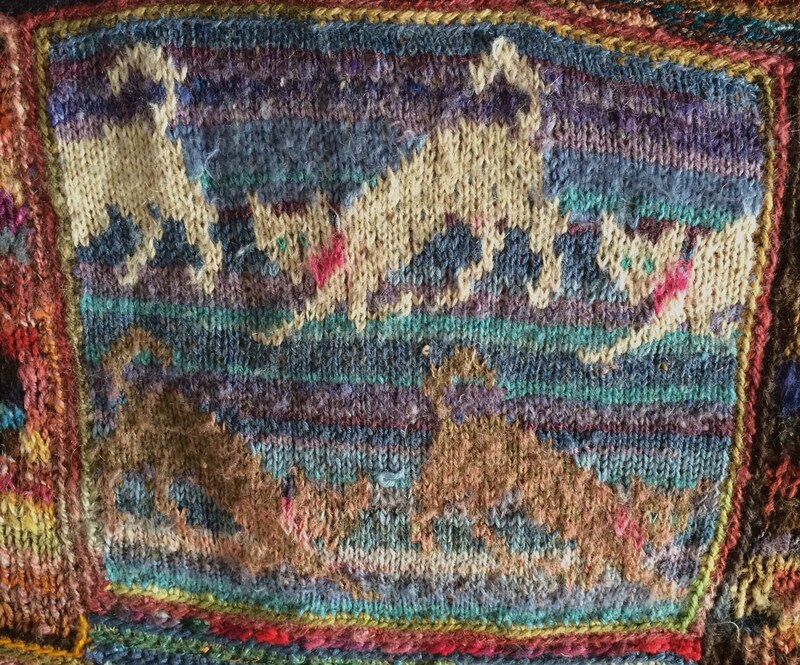 To help thread the yarn through the holes at the top, he’s added a specially designed hook which is resting in the central orifice. 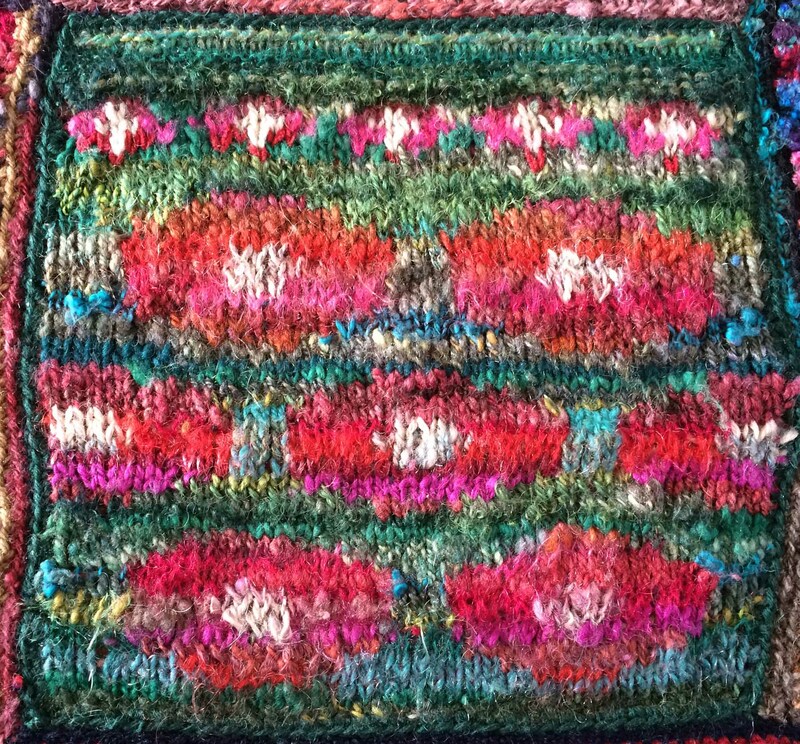 Here’s a basketful of my finished product. So tasty, it’s almost edible. 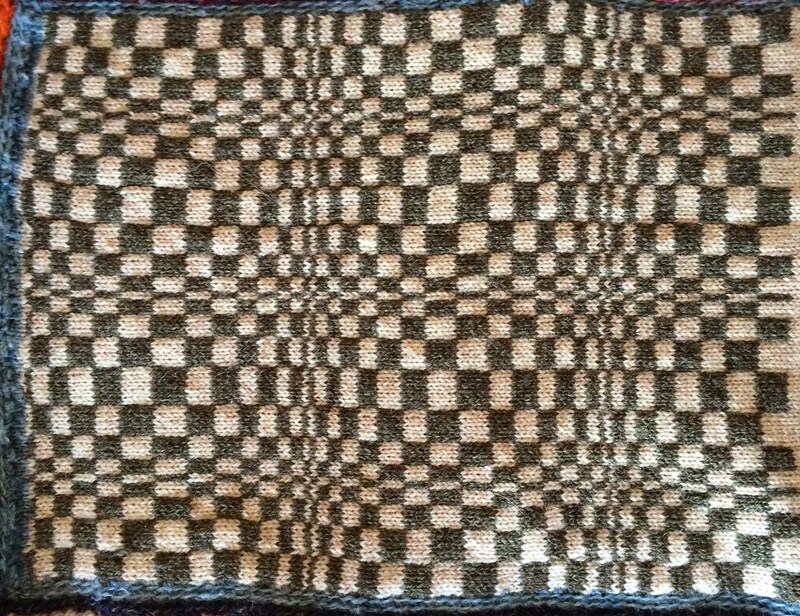 Are you wondering what I’m making? So am I! I’m just spinning away for the sheer pleasure of spinning. 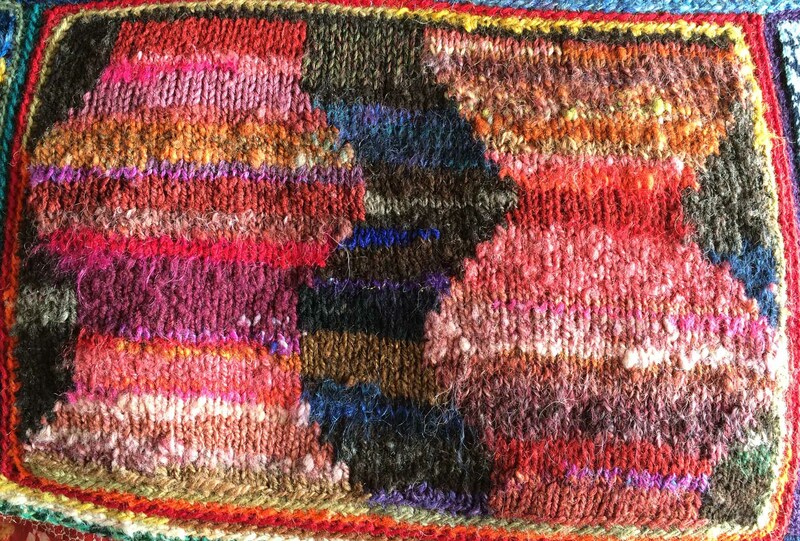 One day this yarn will find it’s purpose. A final spin then of the old wheel with my new wheel waiting in the wings. Ave atque vale.